So now that you’ve had this container of gluten-free flour mix sitting in your cupboard for the better part of a month, are you ready to do something with it? And by gifts we mean pancakes, of course! 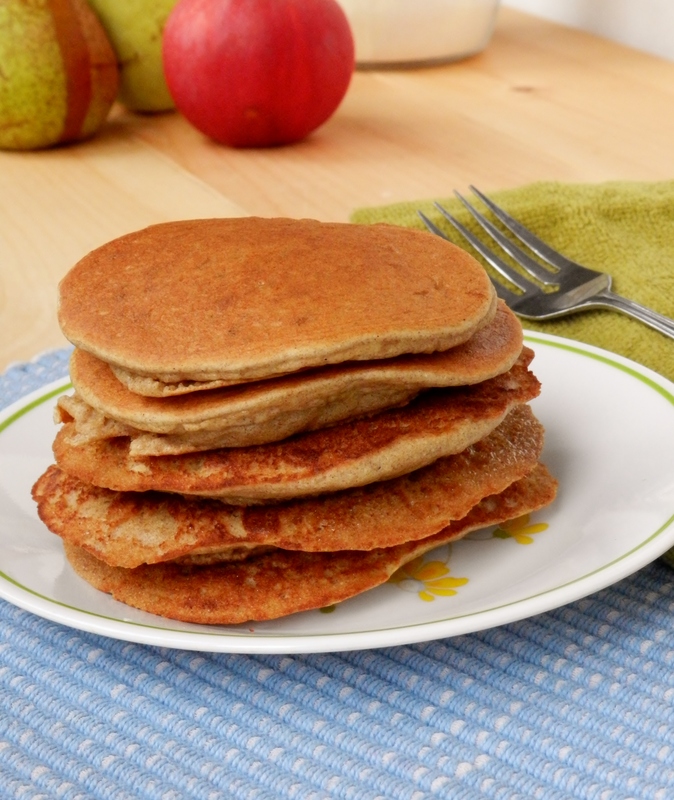 Of course, we couldn’t just have plain pancakes for breakfast (where’s the fun in that?) 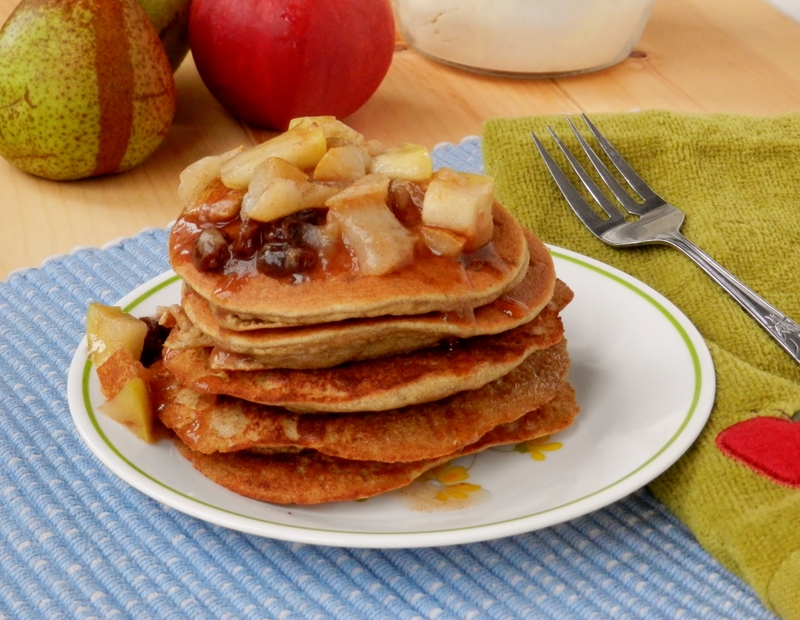 so, in the spirit of Fall, we topped ours with a little pear-apple concoction! 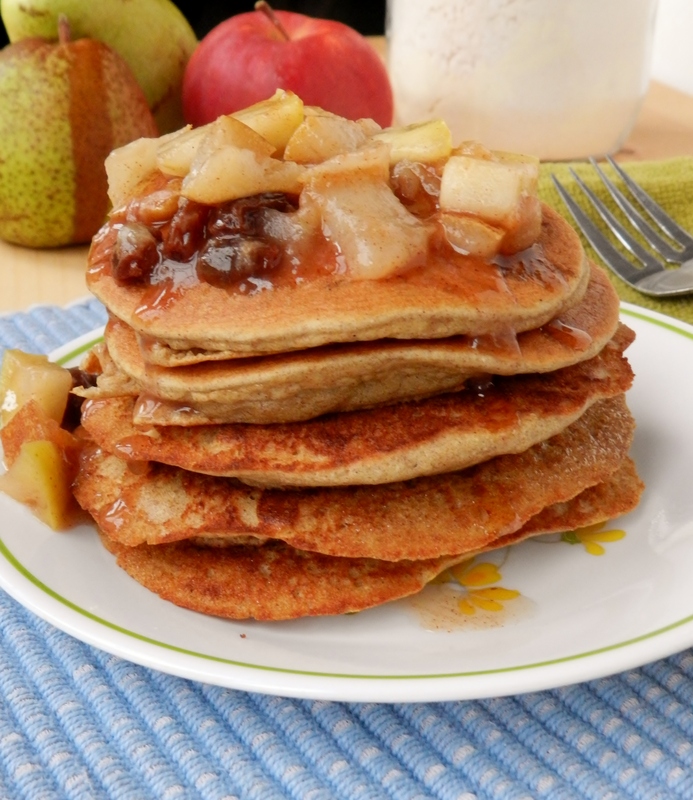 Cinnamon, pears, apples, raisins and a splash of maple syrup goes a looong way, people! But before you go running to your kitchen to make these, let’s have a little chat about gluten-free baking. 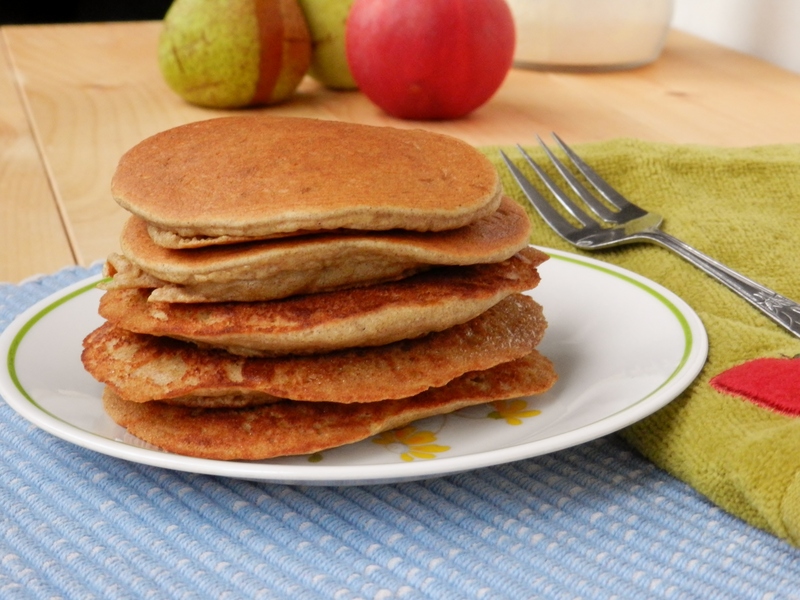 Well, okay, we suppose making pancakes isn’t exactly baking, per se, but it’s close enough, in our opinions! The main thing to remember when adapting a recipe to use gluten free flour is that different types of flours have different liquid-holding capacities, so always cut back on the liquid by at least a third, then gradually add liquid in until you’ve reached the consistency you want. Which leads us to rule #2: when using gluten-free flour, your batter should be thicker than when using standard white or whole-wheat flour. This is especially true for pancakes if you want them to be thick and fluffy, which is obviously what everyone wants in a good pancake! Lastly, you will notice that we added a bit of coconut flour to the batter. This is not entirely necessary (in fact, our first trial didn’t use it) but it really does help make the pancakes thicker and fluffier. If you`re worried about a coconutty flavour, fear not because the small amount we’ve added doesn’t change the taste one bit! Coconut flour is also really easy to find (in Canada you can get it at the Bulk Barn). But if you decide to leave it out, you may want to cut back on the liquid slightly. Pre-heat a non-stick skillet or pancake griddle over medium-high heat. In a medium-sized bowl, combine all the dry ingredients. Combine the wet ingredients in a separate, small bowl. Add the wet ingredients to the dry ingredients and stir until just combined. Add all ingredients except water to a small pot and stir to combine. Add the water and bring to a boil. Cook on high for 2-3 minutes, stirring frequently. Turn the heat to low and simmer, stirring every couple minutes, until the apples and pears are cooked and the sauce has thickened. 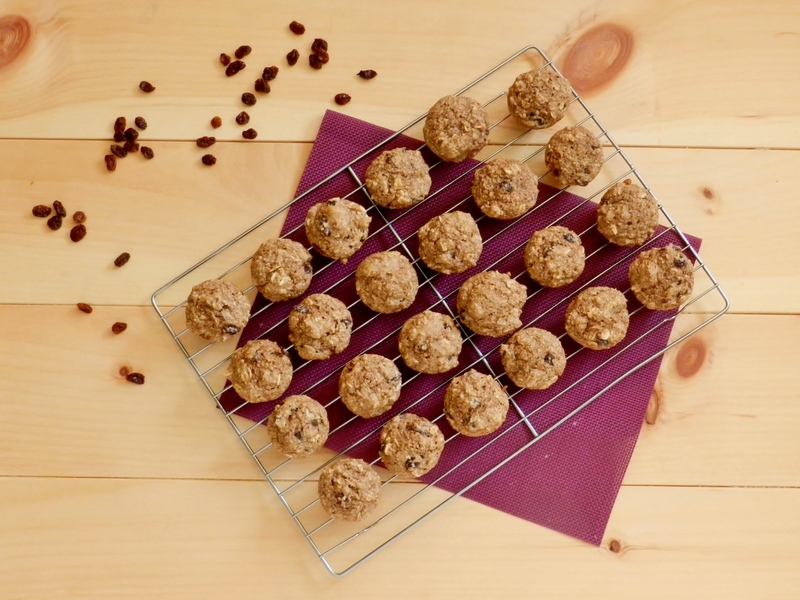 Have you ever tried adopting a recipe to be gluten-free? What was challenging about it? Posted in Uncategorized and tagged apple, apple cinnamon, banana nut, blueberries, breakfast, chocolate, chocolate chips, cinnamon, coconut flour, delicious, gluten free, gluten free flour, gluten free pancakes, healthy, high fiber, high fibre, low fat, maple syrup, pancakes, plain pancake recipe, plain pancakes, pumpkin gingerbread, raisen, raisin, recipe, strawberry shortcake, toppings, Two Saucy Sisters, twosauc, vegetarian. Bookmark the permalink. We’re pretty sure it has been ages since we’ve talked about pancakes over here- did you think we had given up eating them? Of course, that would crazy talk! Who in their right mind would ever give up eating pancakes? You see, we’ve discovered a new way to make pancakes, and quite frankly we may never eat them any other way ever again! 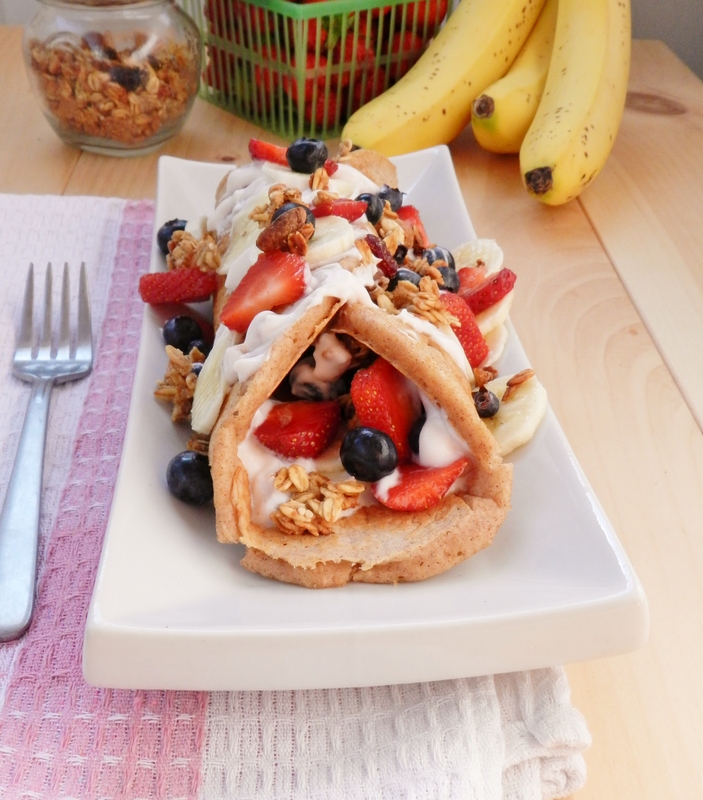 Ladies and gentlemen, we give you the pancake parfait roll-up! Seriously people, this is a genius idea! 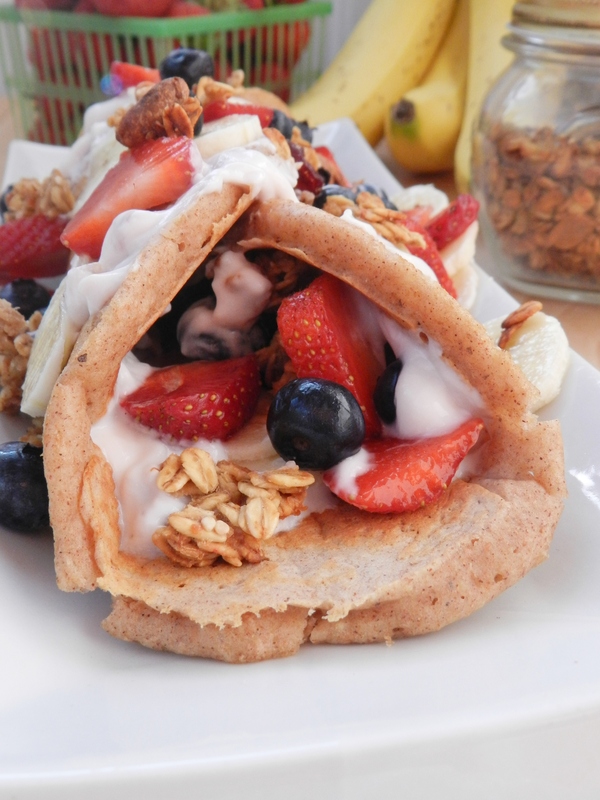 It’s a fruit-and-yogurt parfait all wrapped up in a thick, fluffy pancake- does it get any better than that? Unfortunately there was no sound to accompany the show (yes, we watch silent foodie shows while lifting weights…) so we have no idea what restaurant was being featured and cannot properly give credit to whoever came up with this fantastic idea. But we can share it with the world! So what is so great about a pancake roll-up? It takes about half the time of regular pancakes! Think about it- one giant pancake vs. making a whole bunch of small ones? Some of you cool kids might have one of those awesome pancake griddles that have enough space to cook a million pancakes all at once, but for those of us who don’t, this is a huge time-saver! So go make use of all the delicious fruit that is hitting its prime right now, and make yourself this to-die-for breakfast- you may never eat pancakes the same way again! Preheat a large frying pan sprayed with cooking spray. Combine the dry ingredients in a medium-sized bowl. In a separate bowl combine the wet ingredients. Add the wet ingredients to the dry and stir until just combined. Divide the batter in half and pour onto the frying pan. Cook for 2-3 minutes, or until bubbles begin to form on the surface and the edges begin to firm. Flip and cook for another 2 minutes, then remove to a plate. Repeat with the rest of the batter. 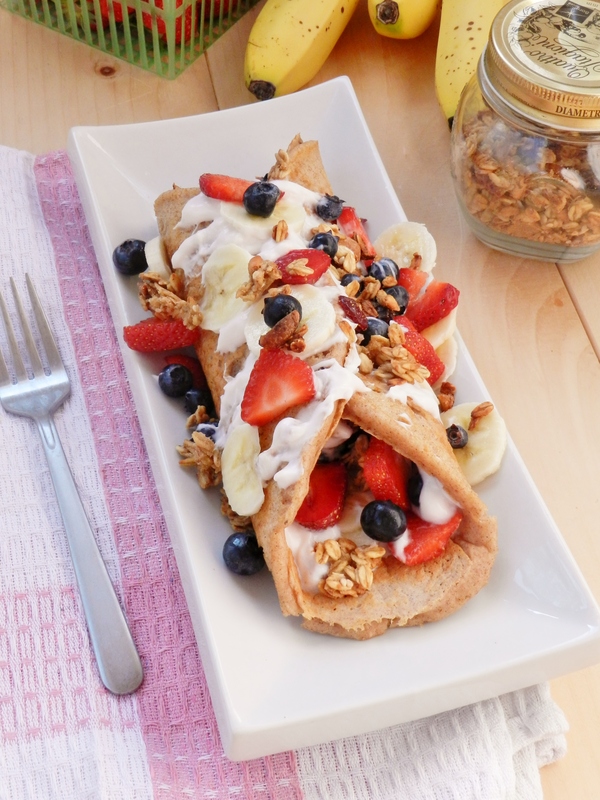 Spread the pancake with yogurt then sprinkle with fruit and granola. 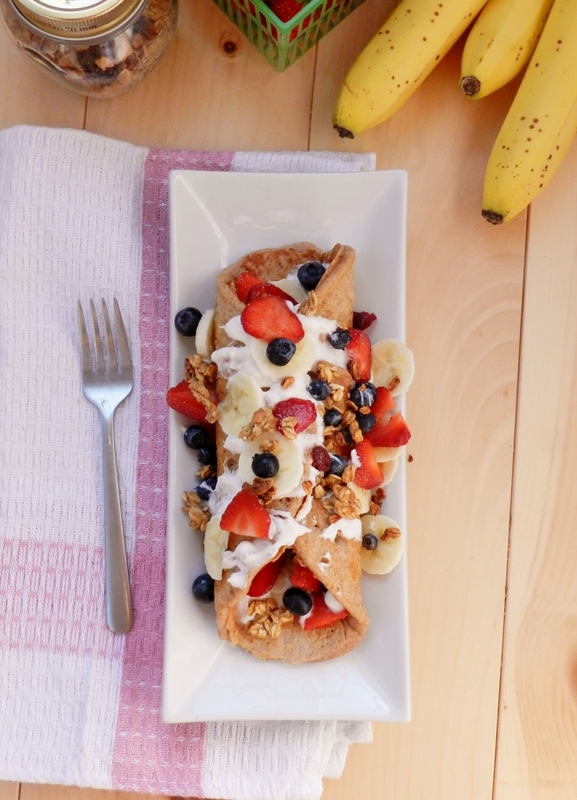 Roll up and top with the rest of the yogurt, fruit and granola. Drizzle with a little maple syrup if desired. Do you ever watch the T.V. at the gym? Have you ever seen a recipe from a T.V. show that you’ve tried recreating? How did it turn out? 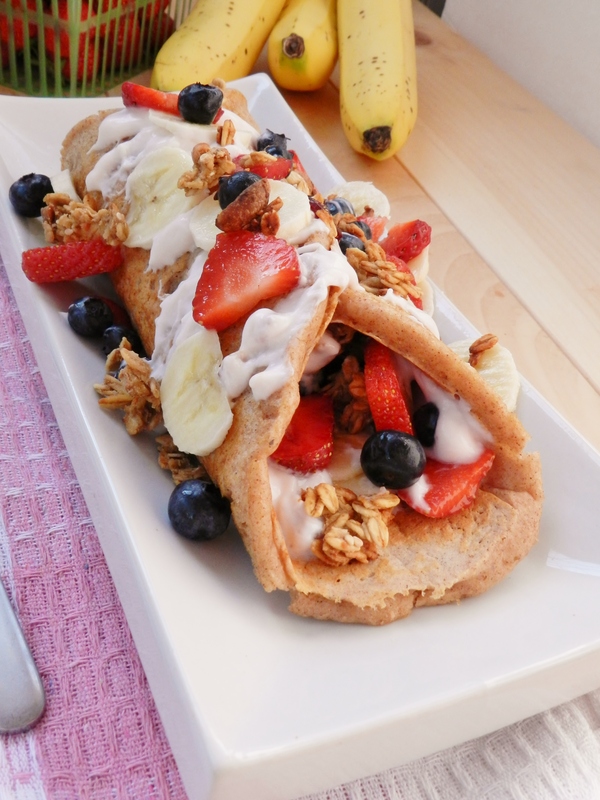 Posted in Uncategorized and tagged breakfast, buttermilk, cinnamon, fruit and yogurt, granola, healthy, low fat, low sodium, low sugar, pancake, parfait, roll-up, whole grain, whole wheat, whole wheat flour, whole wheat pancake. Bookmark the permalink. 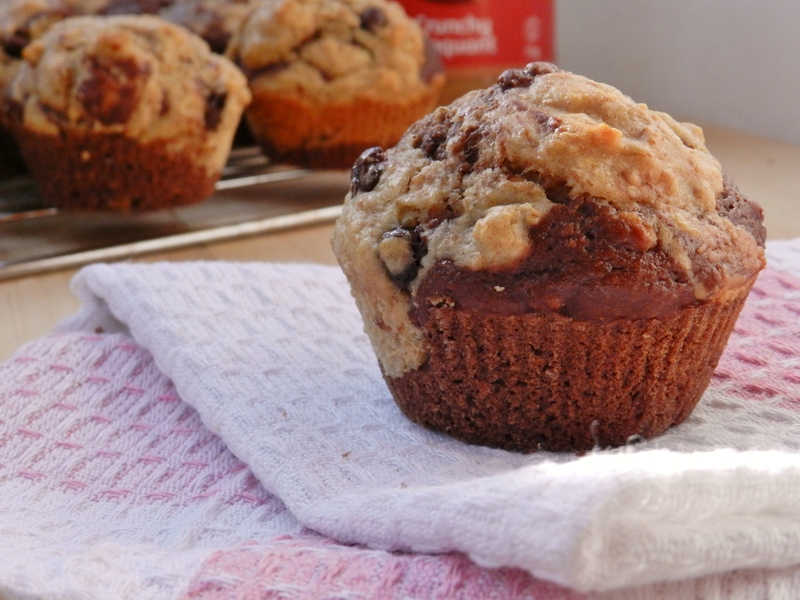 Muffins are our answer to everything. Need a quick lunch snack? Muffins. Want a light breakfast? Muffins. Packing for a road trip? Muffins. Bored? Why not do some baking to pass the time? Why not bake muffins? Our other answer to everything is chocolate and peanut butter. Obviously. We don’t want to be redundant, or predictable, but our craving for chocolate and peanut butter is just never quite satisfied. And we were baking these to share with a friend who’s favourite flavour combo also happens to be chocolate and peanut butter, so in our minds the decision was already made! 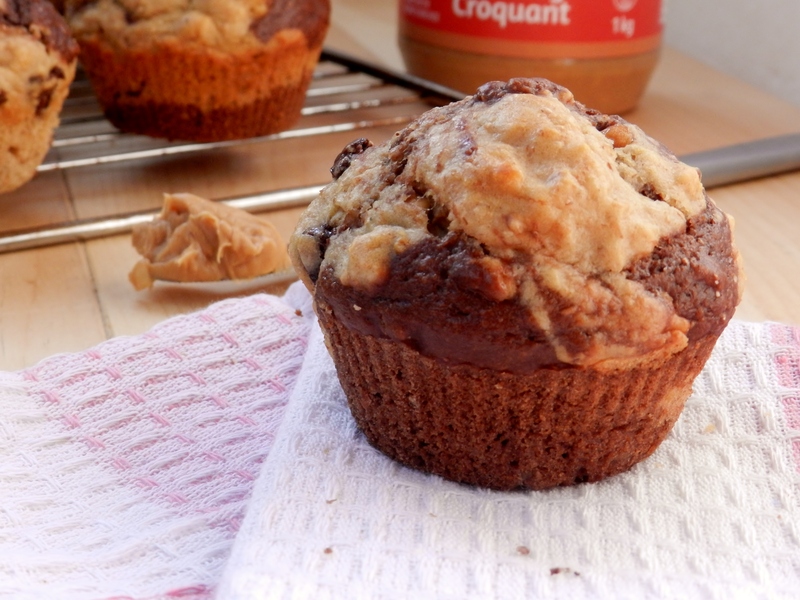 So in case you haven’t guessed already, these are chocolate peanut butter muffins. Make that chocolate peanut butter swirl with chocolate and peanut butter chips. These little beauties are truly decadent. And they’re the perfect snack to bring along for post-race snacking, Toronto road-tripping, beach-bumming and post-night-out-breakfasting. All of which took place in a span of 24 hours this past weekend. 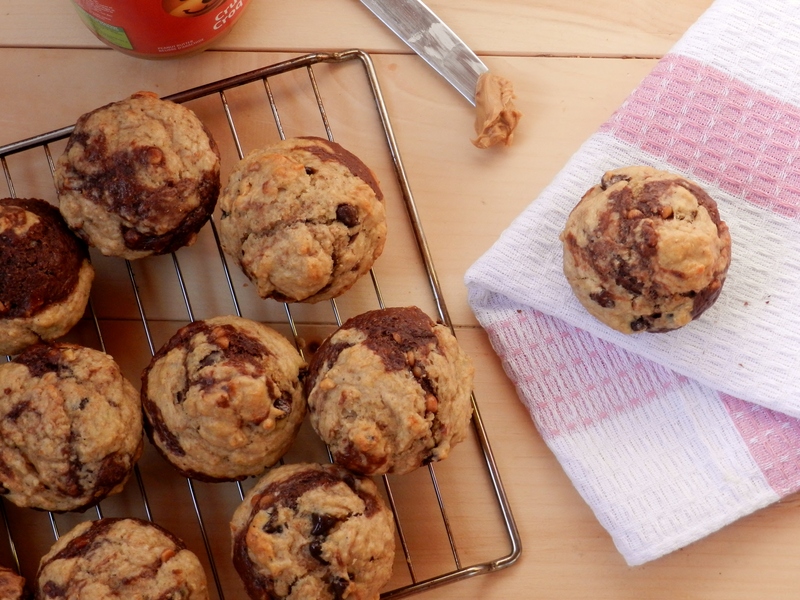 So the real question is: can you ever have too many muffins? No, no you cannot. We suppose the other question is: can you ever have enough chocolate and peanut butter? Again, the answer is no. And these little snacks are the perfect marriage between the two. Win-win! 1/2 c. semi-sweet chocolate chips. Preheat the oven to 350F. Spray two muffins pans with non-stick cooking spray. In two large bowls, combine the dry ingredients for both batters separately. In two separate smaller bowls, combine the wet ingredients for both batters separately. Pour the wet ingredients for each batter into the bowls of dry ingredients. (You will have two bowls with two different batters). Stir both bowls just until everything is combined and there are no dry spots. Gently stir the chocolate chips into the peanut butter batter and the peanut butter chips into the chocolate batter. 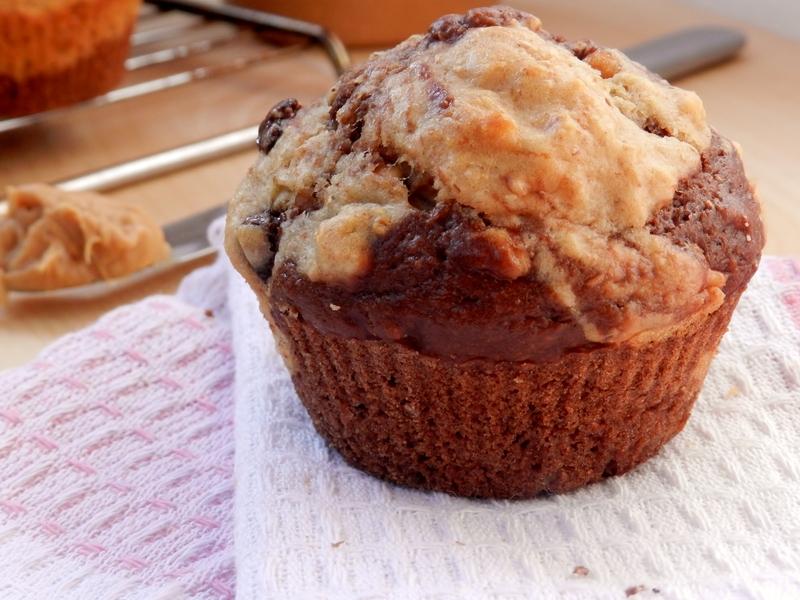 Place a spoonful of the chocolate batter into each of your muffins tins, only filling the muffin tin about 1/3-1/2 full with the chocolate. Now go along and top the chocolate batter with a spoonful of peanut butter batter. Using a butter knife, gently swirl the two batters together. 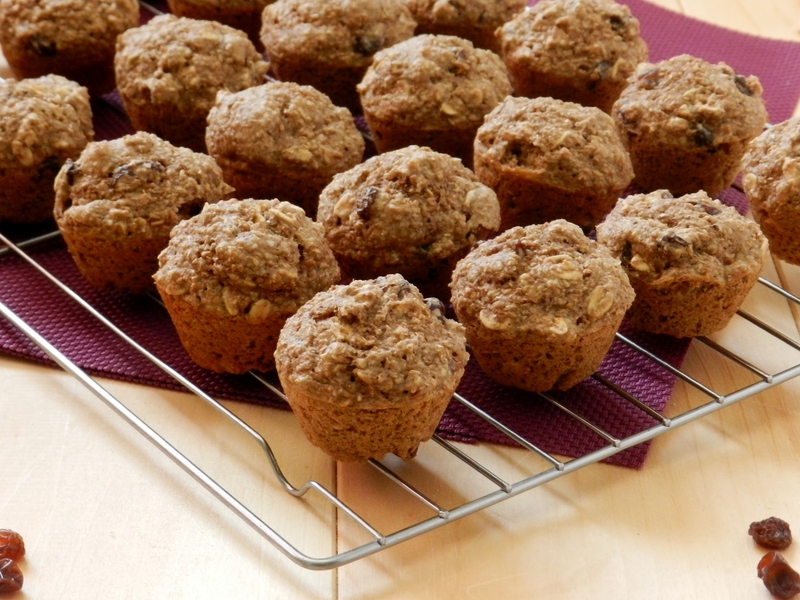 Bake for 20-25 minutes, until the muffins are firm yet still soft. Do you like muffins? When you have to make snacks, what are your go-to favourites? Posted in Uncategorized and tagged bake, beach, breakfast, breakfast muffins, c peanut butter, chocolate, chocolate chips, chocolate muffins, chocolate peanut butter, chocolate peanut butter swirl, easy, egg, egg white, food, healthy, low fat, low sugar, low sugar muffins, muffins, peanut butter, peanut butter chips, peanut butter muffins, race, recipe, road trip, snack, swirl, Two Saucy Sisters, twosaucysisters, unsweetened applesauce, vegetarian, whole wheat flour. Bookmark the permalink. So, yesterday our kitchen turned into a bit of a waffle-making factory. But we had a race yesterday evening, which meant no sitting in the sun for us! Talk about torture, right? So what do you do when you need to distract yourself from the gorgeous weather and the desire to spend the whole day outside? You make waffles, obviously. Lots and lots of waffles. Why make such a large batch of waffles? Because you can freeze them and then have fresh, homemade toaster waffles whenever you feel like it! How great is that? 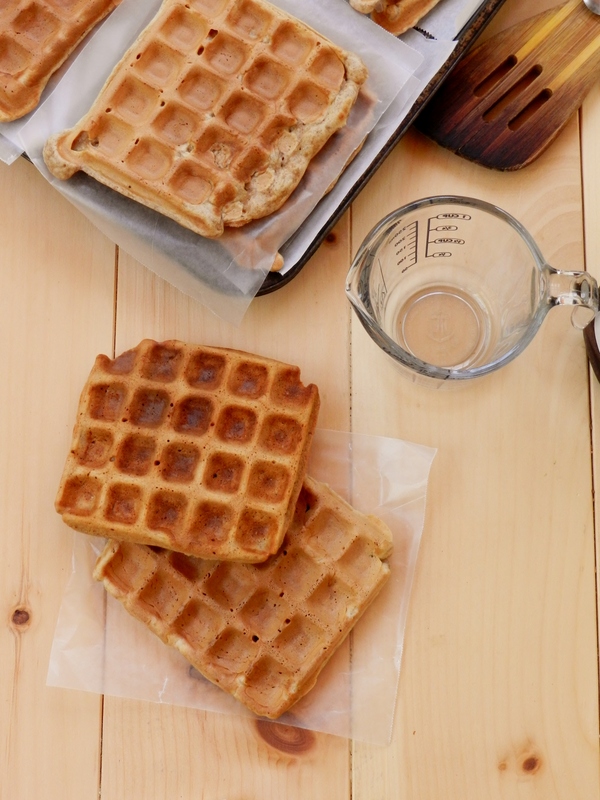 Not that we have a problem whipping up a quick batch of waffles on any given morning, but who doesn’t love just popping them in the toaster to have homemade waffles ready in just minutes? No muss, no fuss, just light, crispy waffles ready to be topped with whatever your heart desires! Strawberries and cream? Bananas and peanut butter? Berry compote? These are such a neutral-tasting waffles that you could basically do anything you wanted! The possibilities are endless! So we didn’t exactly get to enjoy the beautiful weather, but at least now we have a freezer full of waffles, right? 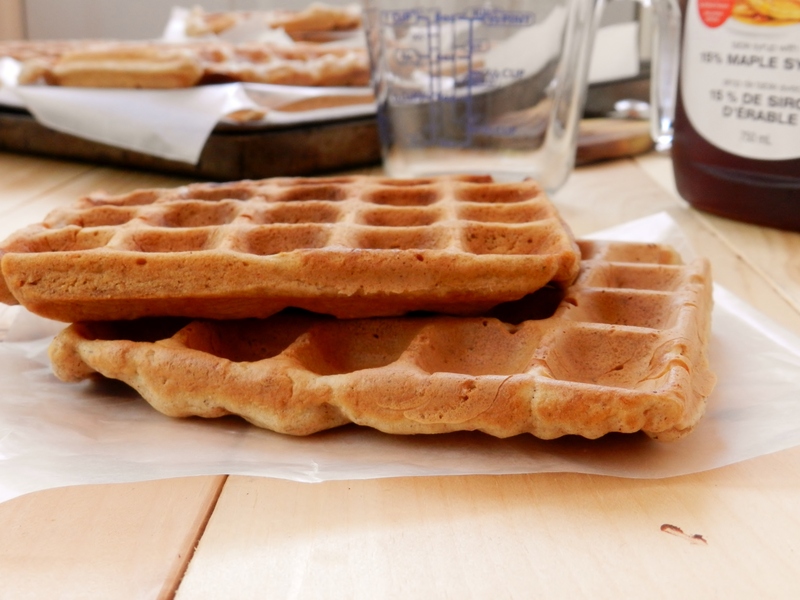 The key to getting a nice, crispy waffle is not putting too much batter on the iron at once. 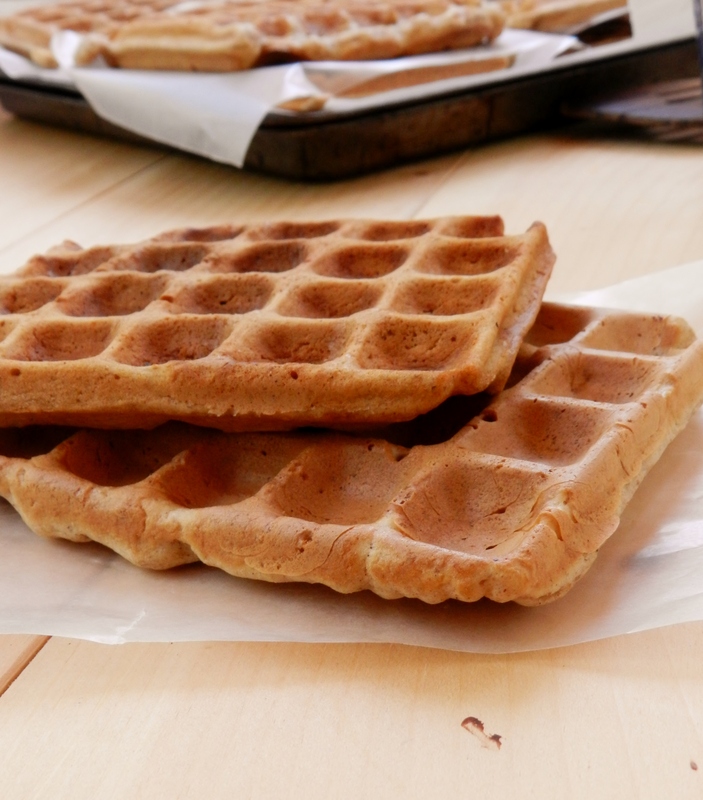 You don’t want it to be too thin, either, but over-loading the plates will make it difficult to get a crispy waffle. Repeat the process until all the waffles are done. Lay the waffles out and allow them to cool. (As some of the first ones start to cool you can start to stack others on top of them with wax paper between each waffle). 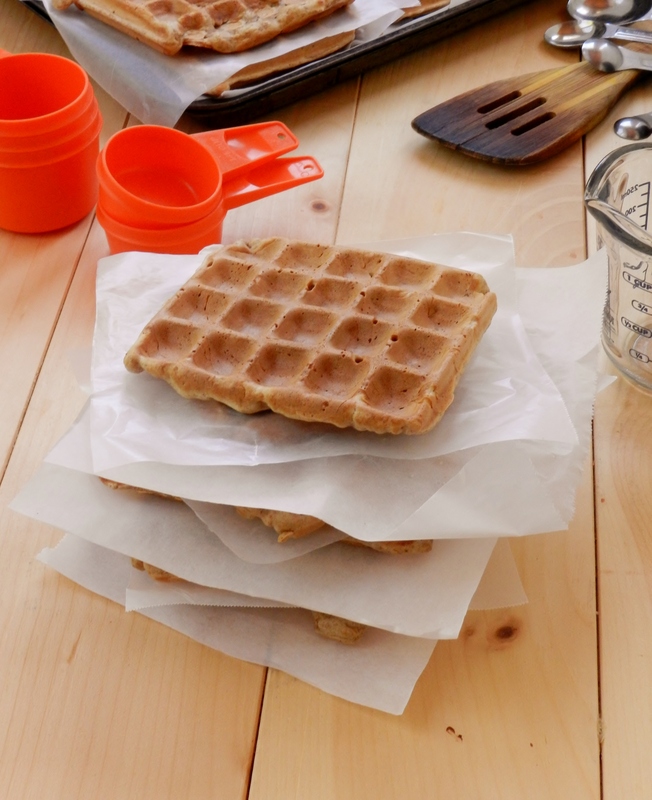 Once the waffles are cool, place them in an air-tight ziplock bag, keeping the wax paper in between them. If they start to get a little soft as they sit, don’t worry because you’ll be toasting them later. 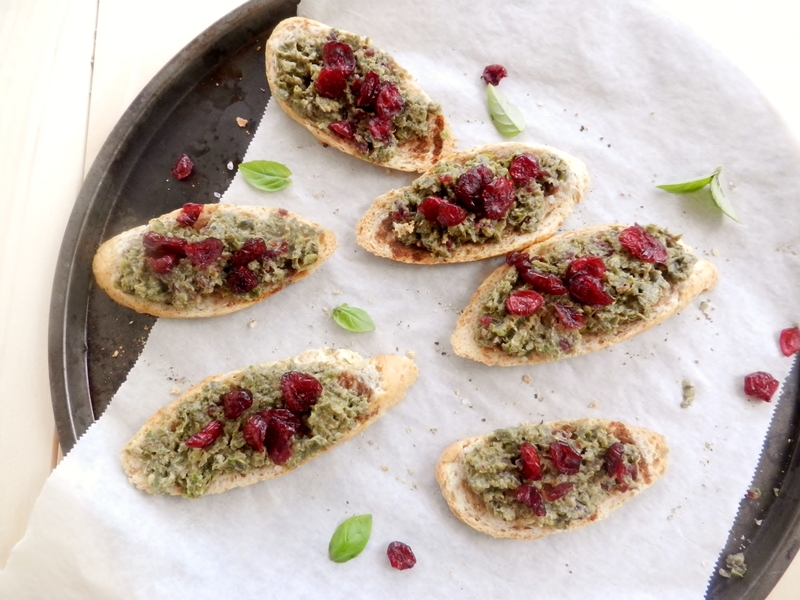 When you want to eat them, remove however many you want from the freezer and pop them straight into the toaster. Then top with whatever you like! Do you like waffles? 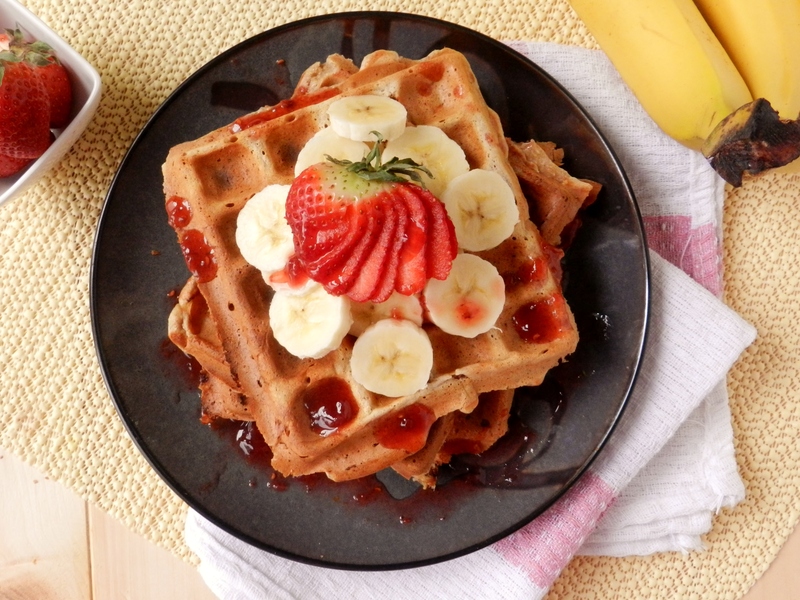 What are your favourite waffle toppings? Posted in Uncategorized and tagged big batch waffles, breakfast, buttermilk, buttermilk waffles, cinnamon, cream bananas, food, gorgeous weather, healthy, healthy breakfast, high fibre breakfast, high fibre waffles, homemade toaster waffles, homemade waffles, liquid sweetener, low fat, low fat waffles, strawberries and cream, sugar free waffles, toaster, toaster waffles, Two Saucy Sisters, twosaucysisters, waffle iron, waffles, whole wheat, whole wheat buttermilk waffles, whole wheat flour, whole wheat waffles. Bookmark the permalink. In light of our recent one-year blogiversary celebration, we thought it would be appropriate to do a recipe round-up of some (emphasis on the “some”) of our favourite/most popular recipes from this past year. Since we can’t just choose a few, though, we’ve broken it down into categories. Enjoy! 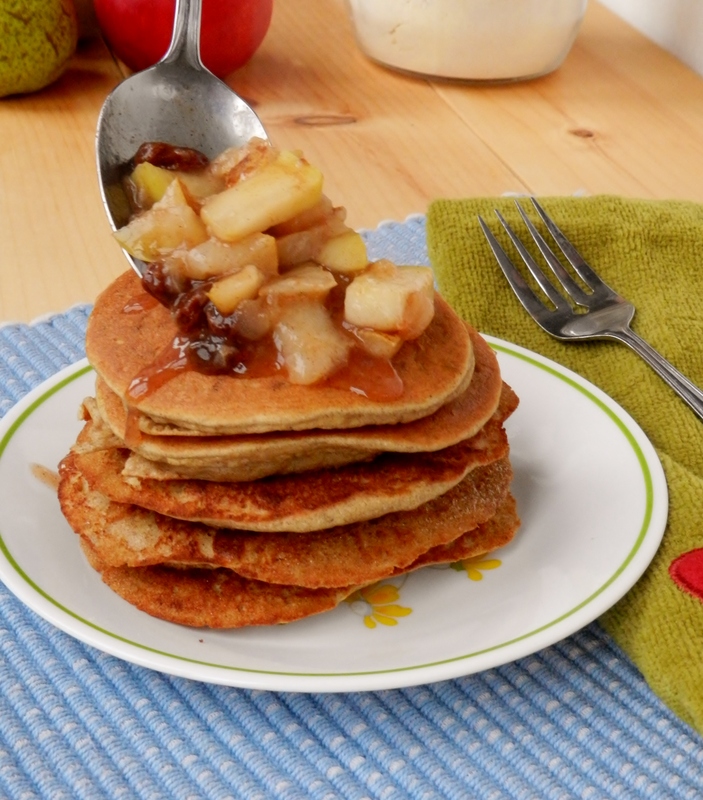 We made these for a crowd a few weeks ago when our family had a giant garage sale along with a few other types of pancakes, but these were the hands-down favourite. 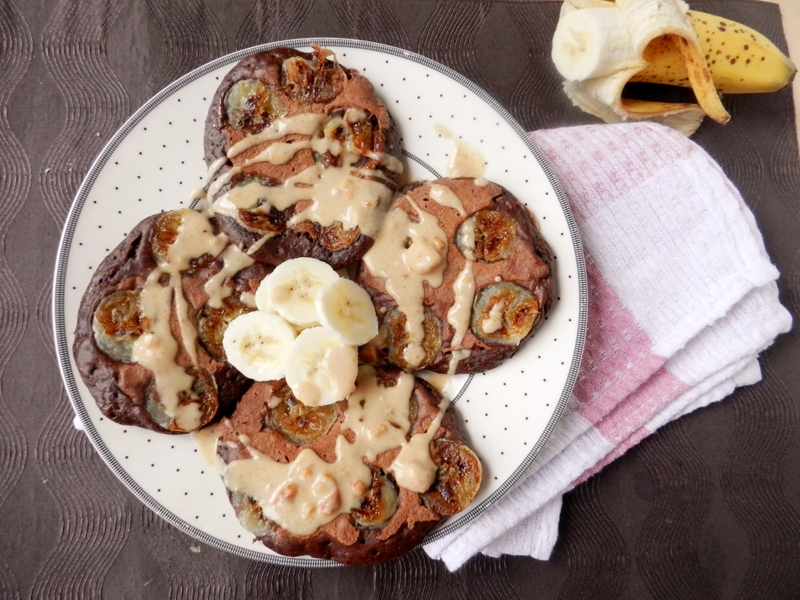 This just confirms in our minds that everyone loves chocolate, peanut butter and banana. 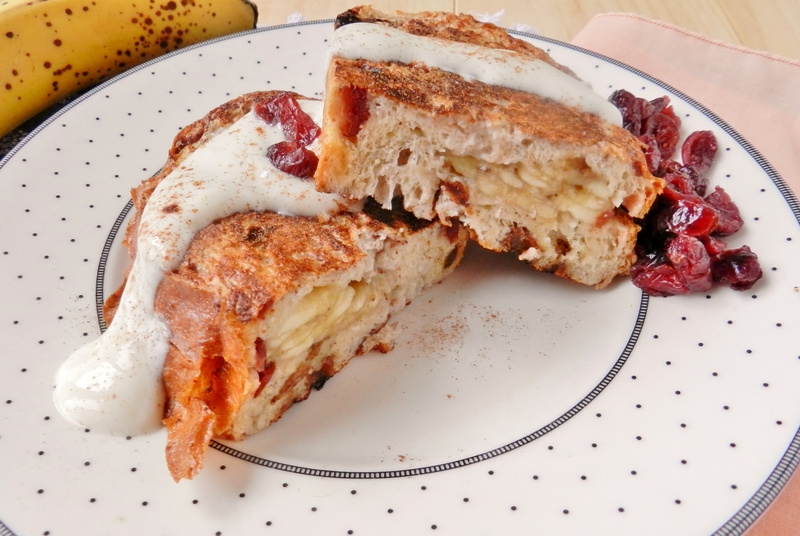 After making this stuffed french toast recipe, we’re not sure if we can ever eat regular french toast ever again. And as if that’s not enough, we also have a blueberry-lemon version and an apple pie version to satisfy all your stuffed french toast needs! If pancakes aren’t your thing, well, you’re crazy, but maybe the satisfying toasty crunch of waffles is more up your alley? Regardless, you should make these right away. 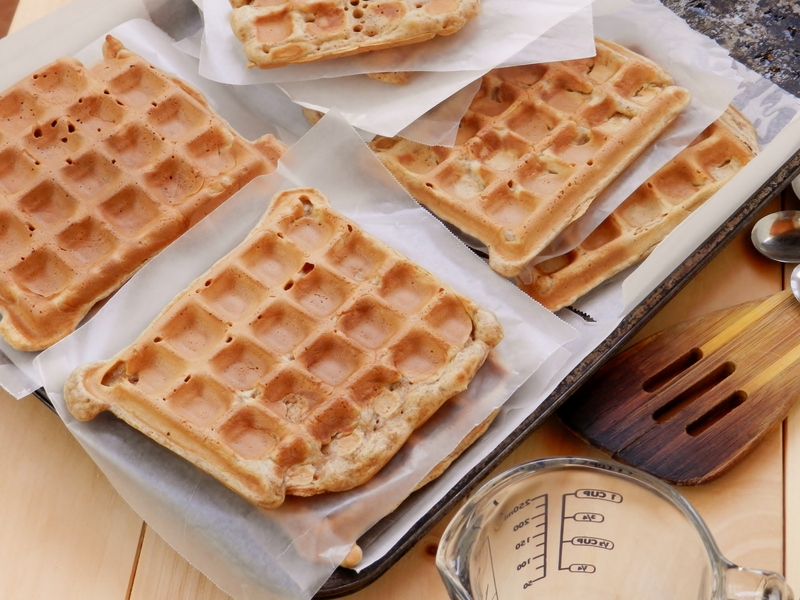 Added bonus- make these in the morning and your house will smell like delicious waffles right through into the afternoon! Ever since our very first peanut butter banana pancake in a jar, we’ve made countless varieties of the genius creation, but this particular version quickly rose to the top as one of our favourites. Probably because it’s so pretty- just look at those bright colours! We love buckwheat bakes, but not only was this one of our all-time favourite versions, this was definitely a reader favourite too! 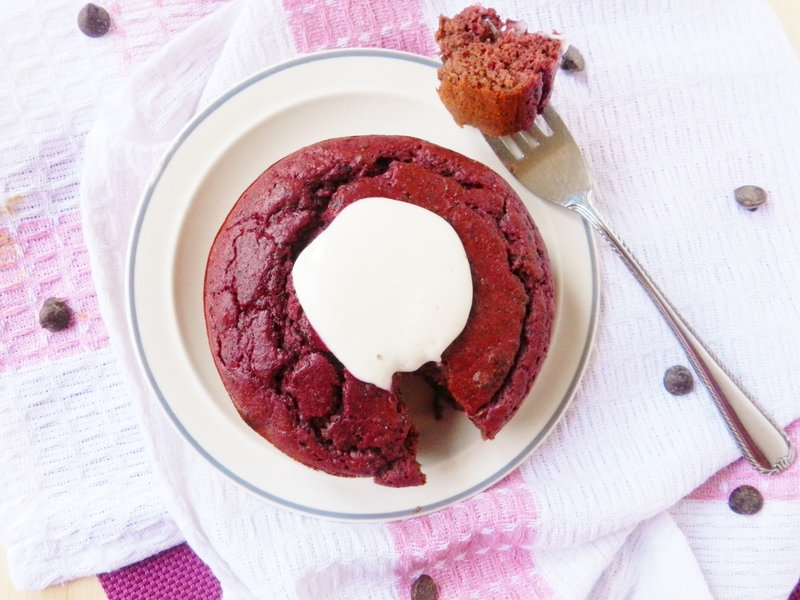 And who doesn’t want to eat red velvet cake for breakfast? Summer is on it’s way, which means so is summer fruit! 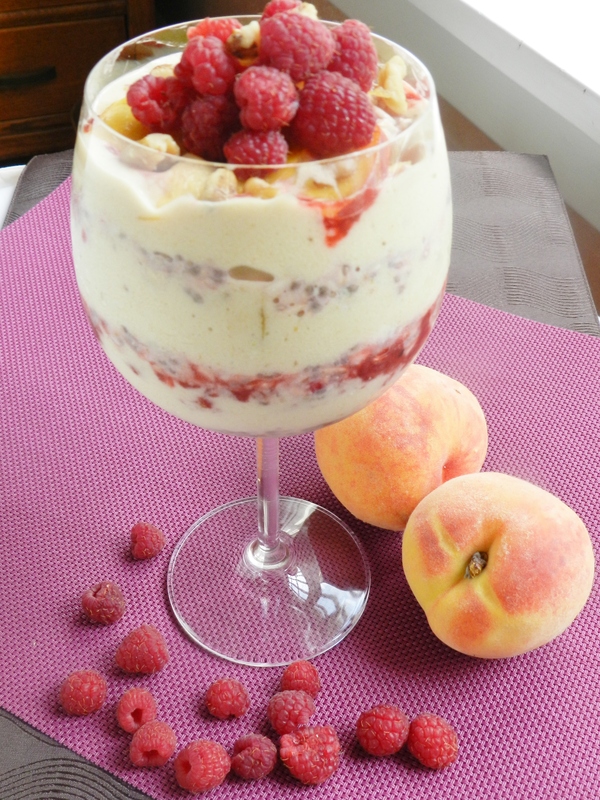 You can be sure that overnight oats parfaits will be on the breakfast menu for us now that the weather is warming up, and as soon as peach season hits we’ll be re-making this wondrous parfait! 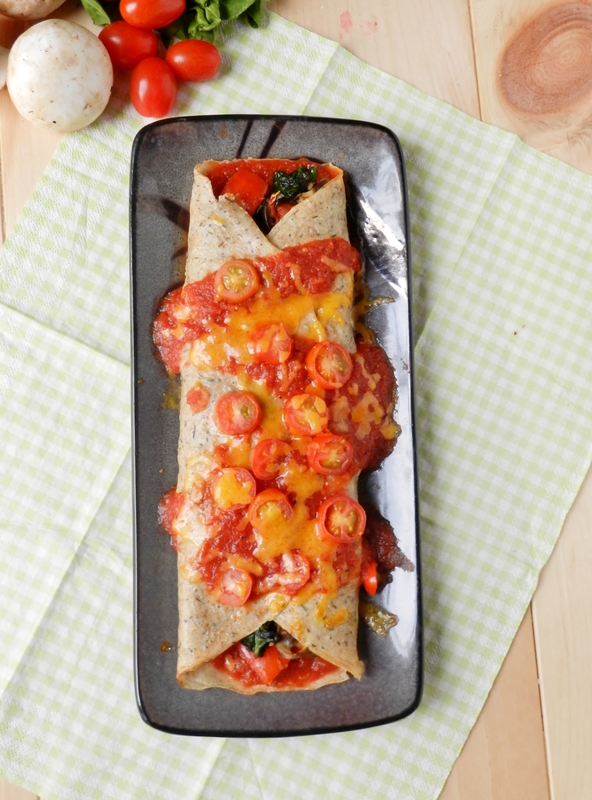 It’s pizza and a crepe at the same time. What more needs to be said? 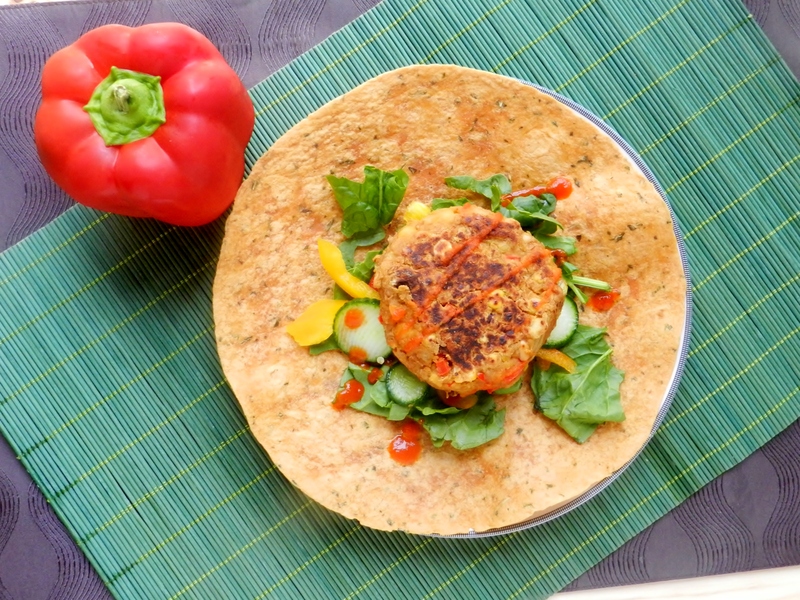 Peanutty chickpea goodness all wrapped up in one delicious vegetarian burger. Yum! 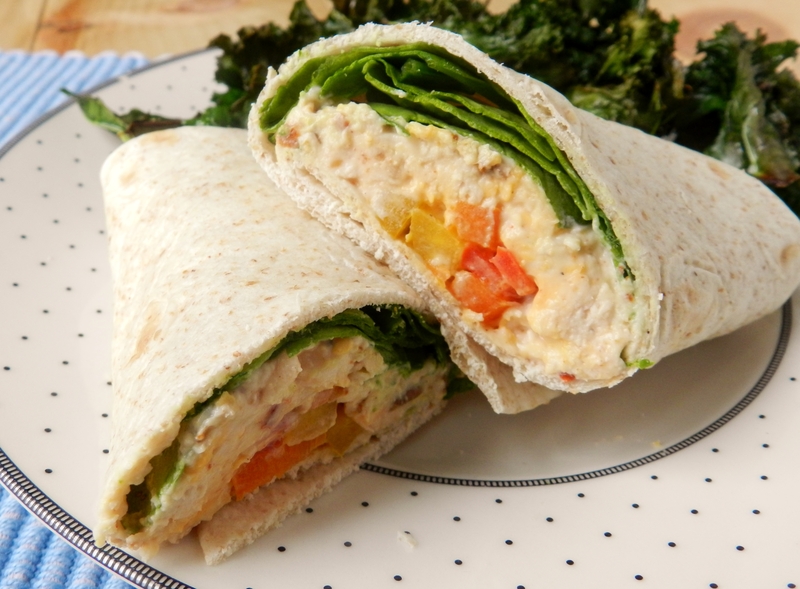 Creamy spicy chicken inspired by one of our favourite on-the-go store-bought lunches. 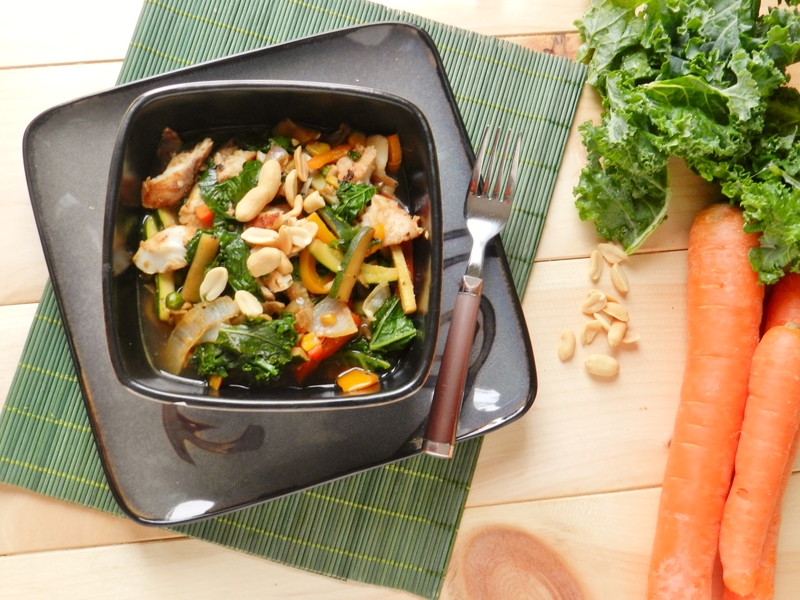 A healthier version of an old stand-by? Yes please! 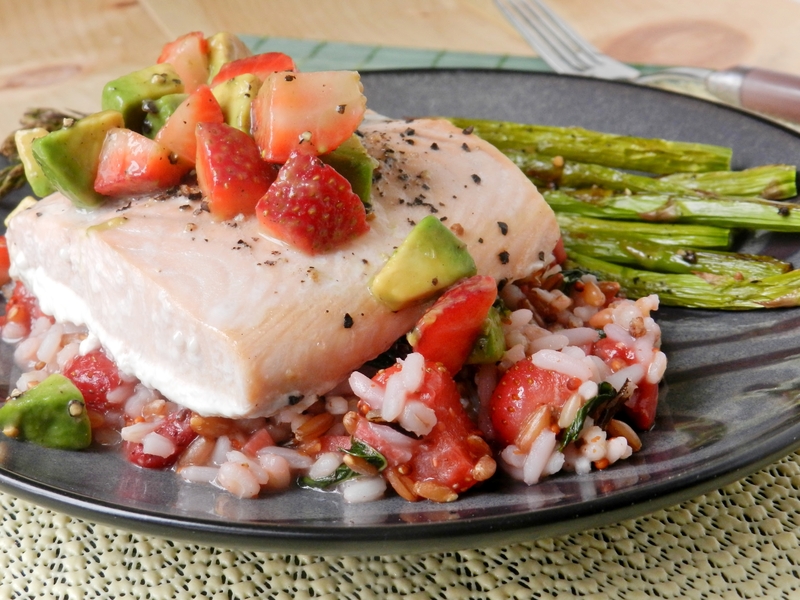 This dish is summery, pretty, healthy and delicious. You really can’t ask for anything more now can you? Pizza is the perfect food. 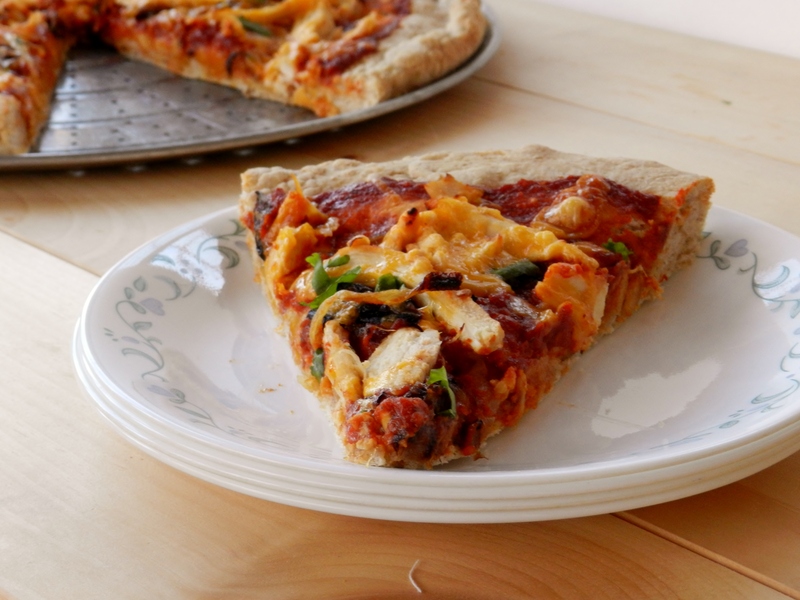 And if it’s possible to improve on perfection, then this pizza definitely did! We loved it, our family loved it- ladies and gents, we have a winner! Countless variations of these were consumed to ward off the chill during the extra-long winter we had this year. 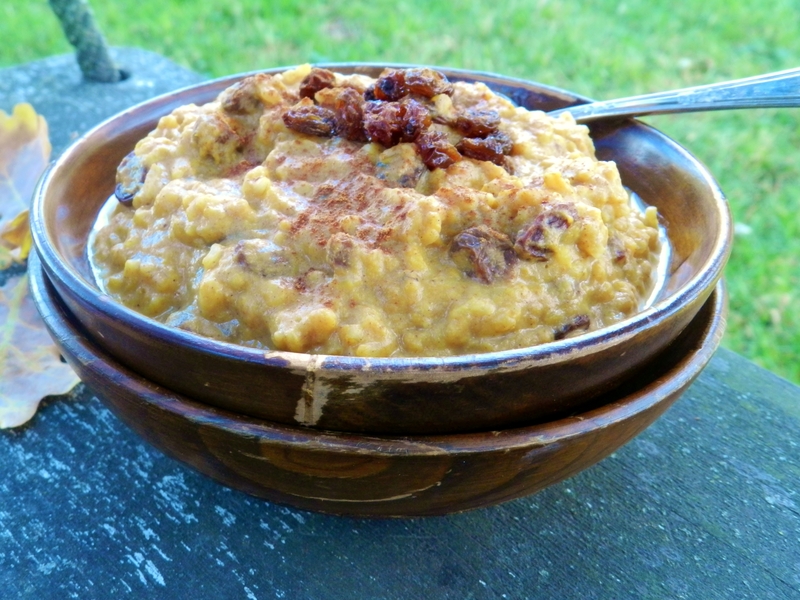 Highly recommended when you find yourself in need of a comforting bowl of warmth on a cold winter night! We do not love pork, but we love this meal! 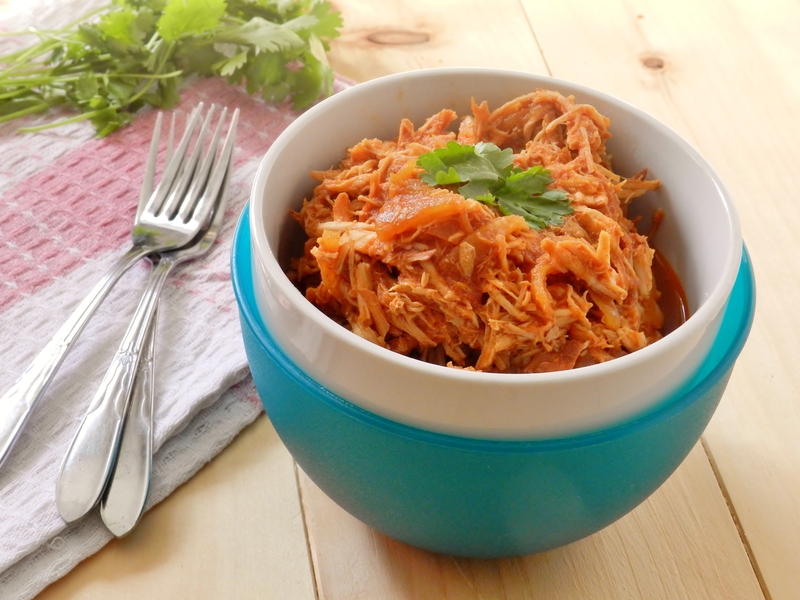 But if pork really isn’t your thing, maybe pulled chicken would suit you better? 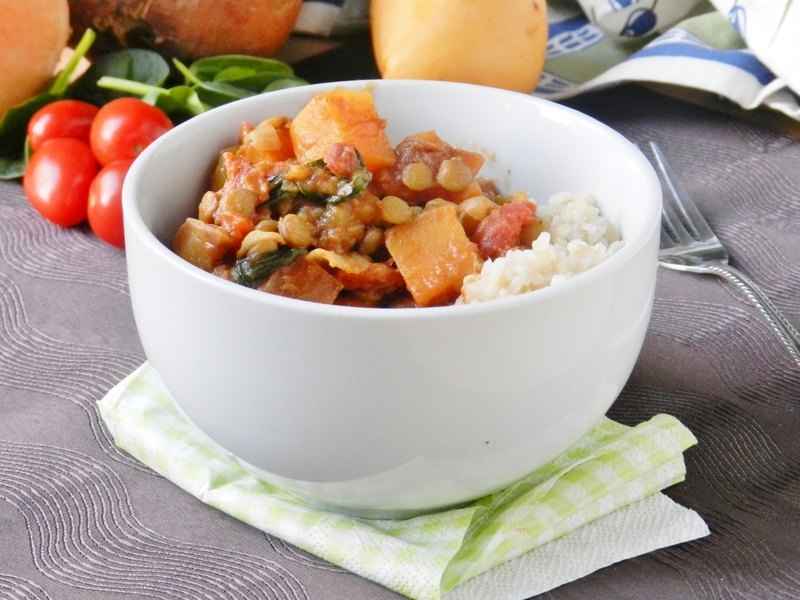 Nothing beats a hearty bowl of curry, but this meatless variety that’s full of veggies, sweet potatoes and chunks of sweet mango really takes the cake! 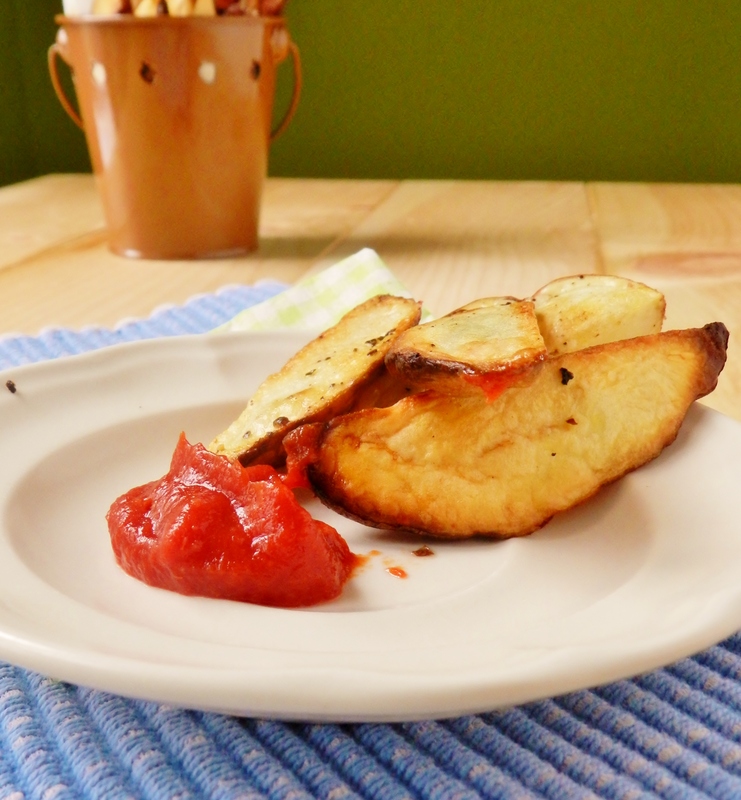 Everyone loves home fries, and these ones use a simple trick to make them nice and crispy every time. 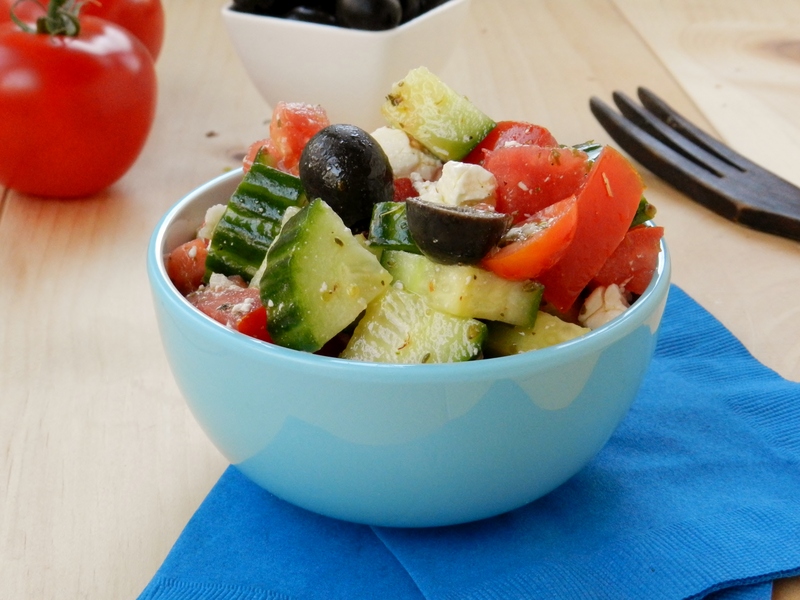 Even if you’re not having a Greek-themed feast you should make this salad! Tangy and colourful, it’s a nice break from a traditional garden side-salad. 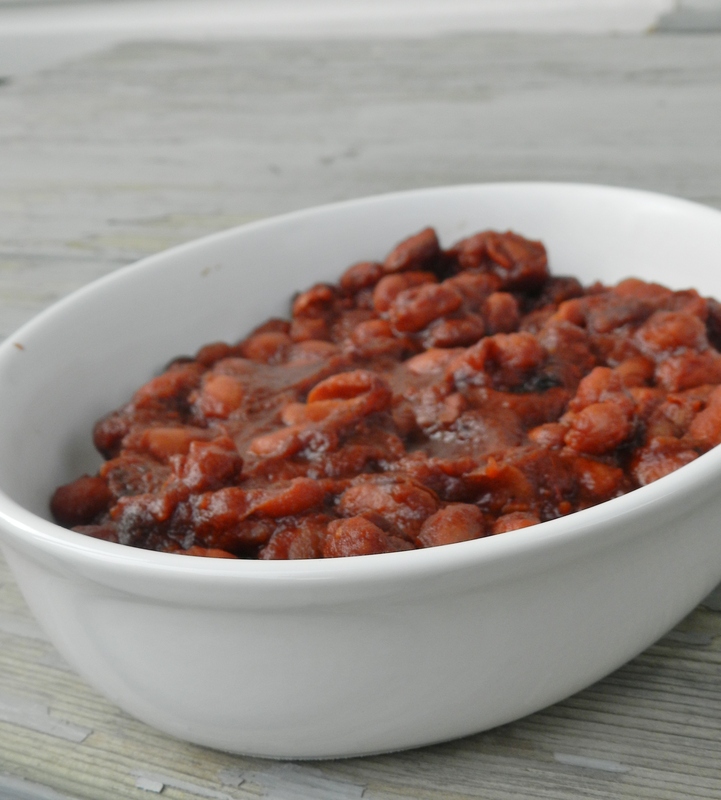 Baked Beans in the slow cooker are an easy way to enjoy the tasty side dish with hardly any effort. 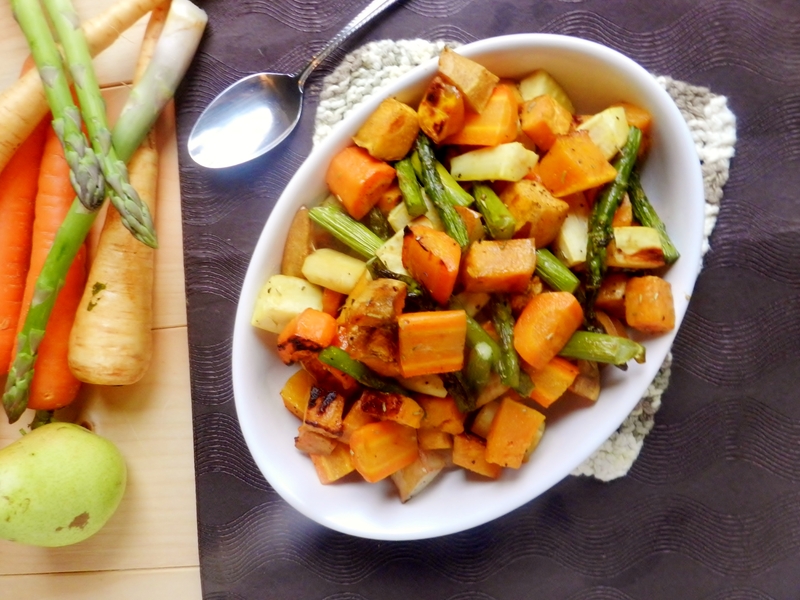 Roasted vegetables are one of the best things in the world- no exaggeration! And yes, we realize that asparagus is not a Fall vegetable, but that is a minor detail. We made a roasted vegetable salad and it was the Fall, ergo Roasted Fall Veggie salad. 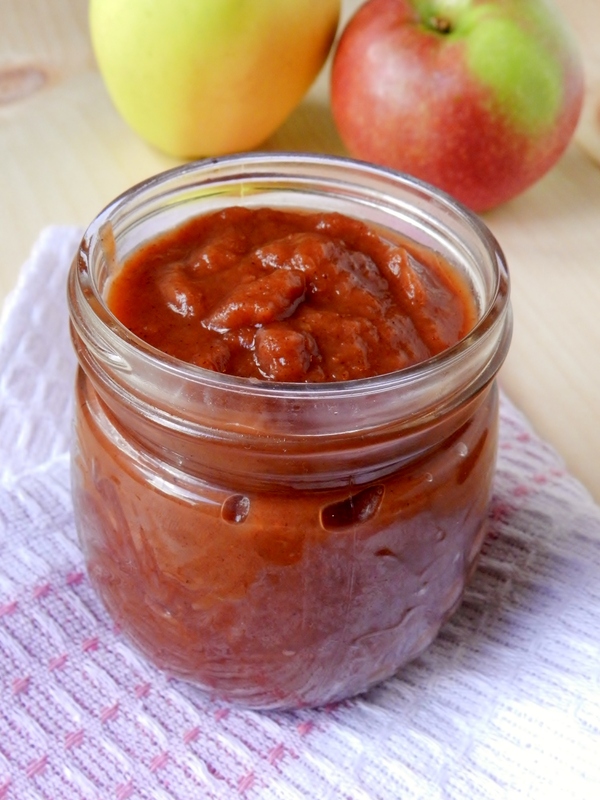 Quite possibly one of the easiest recipes in the entire world with only four ingredients and two steps (ok 3 if you count chopping the apples). 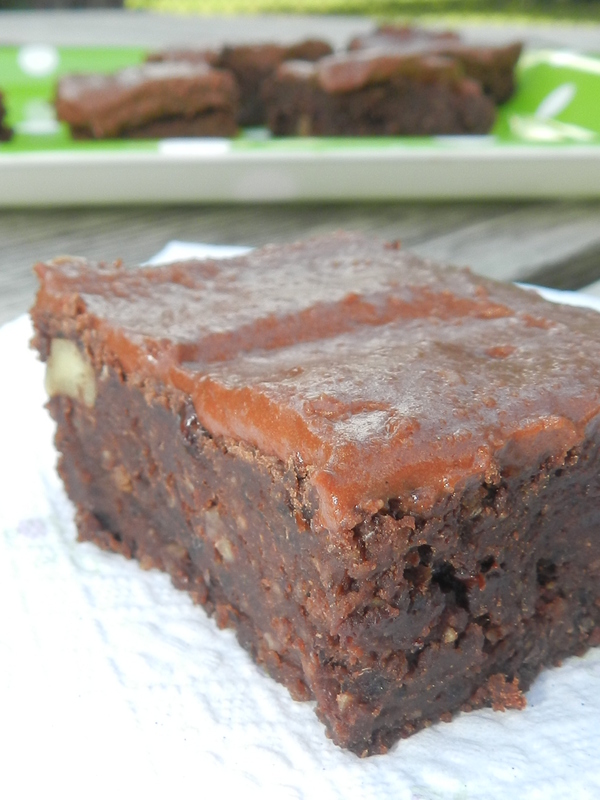 And no added sugar- just pure apple-y goodness! 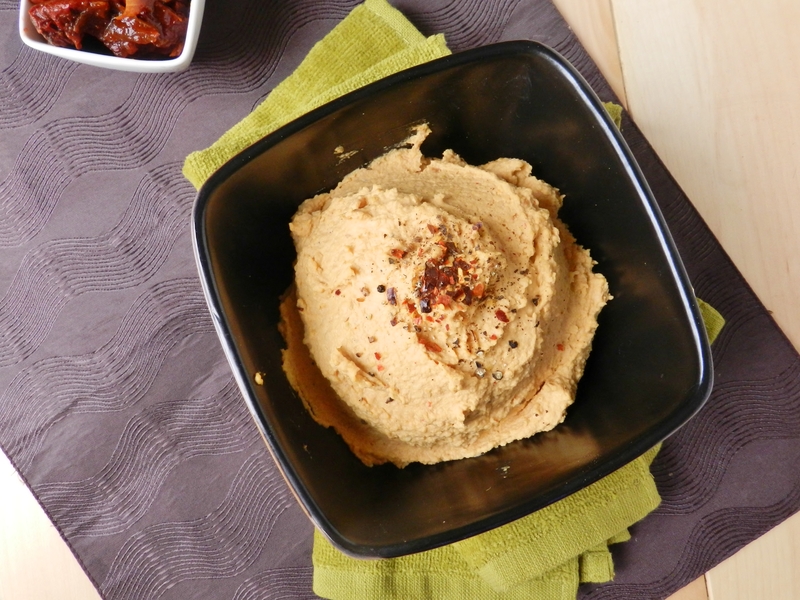 Obviously you knew a hummus recipe was bound to make it on to our list. And to be honest, we put up this recipe not because it’s our favourite, but more as a representation of all our hummus recipes, because how can you really choose just one when they’re all incredible? You can’t. 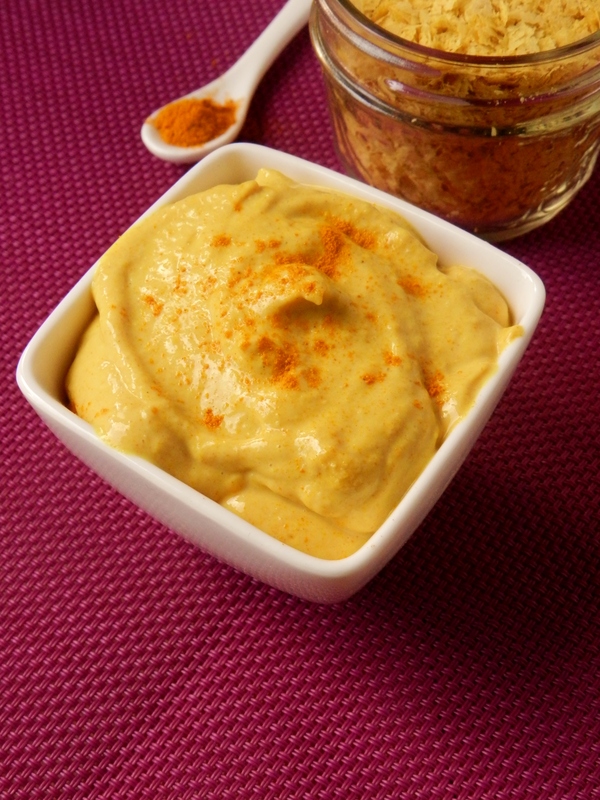 Ok, so this dip is very similar to a hummus recipe- but it is so good that it needed to be recognized all on its own. 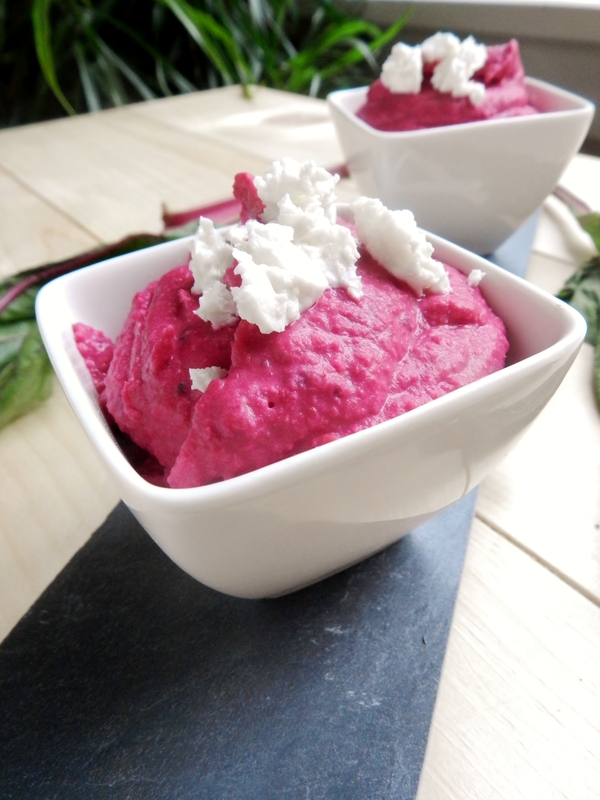 Even if you don’t like beets we bet you would like this dip! It doesn’t really taste like beets, and it has an amzing bright pink colour. Who wouldn’t want to eat bright pink food? 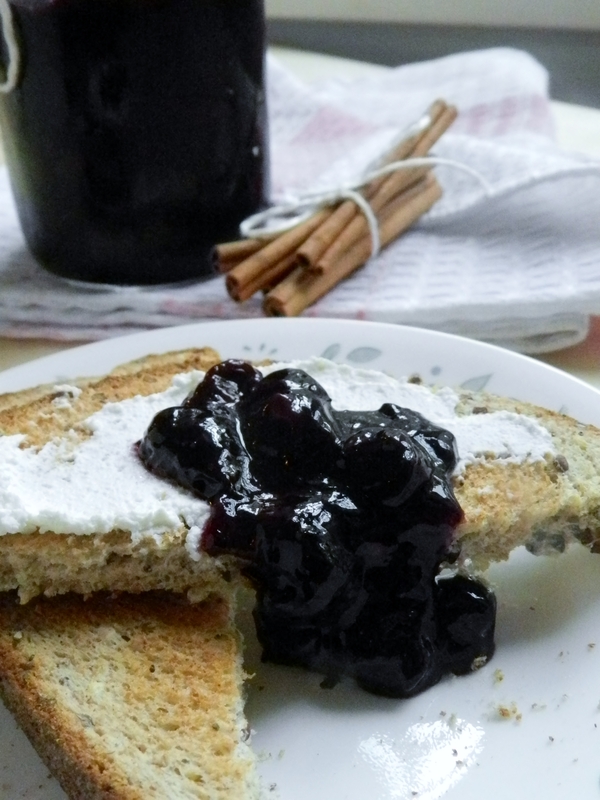 Fresh blueberry jam with a spicy twist. Slather on toast, pancakes, waffles, or eat straight from the jar with a spoon. However you go about it- you must try this jam! 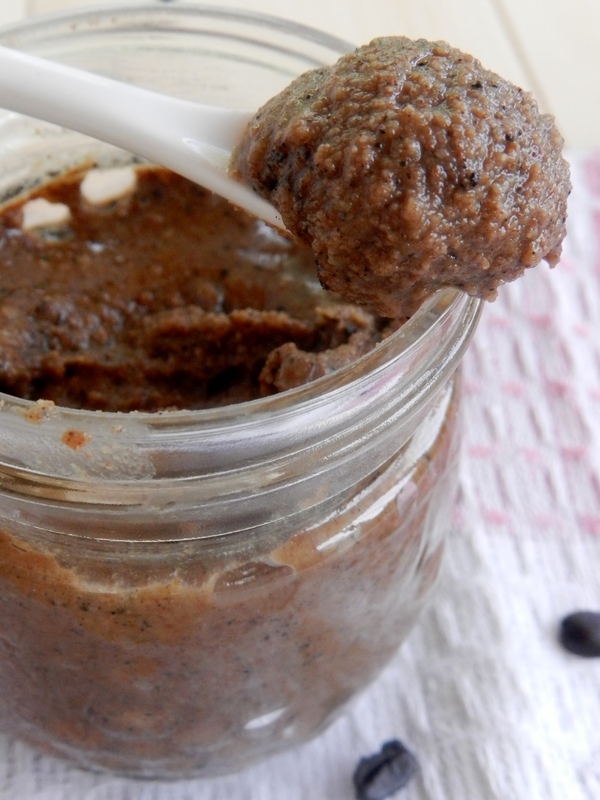 Its a rich, creamy almond butter that tastes like coffee- Java lovers unite! This sauce is so good you’ll want to put it on everything. And we promise no one will ever know there’s no cheese in it. These are the best when you need a quick pre-run snack, or you need something small to tie you over until your next meal. 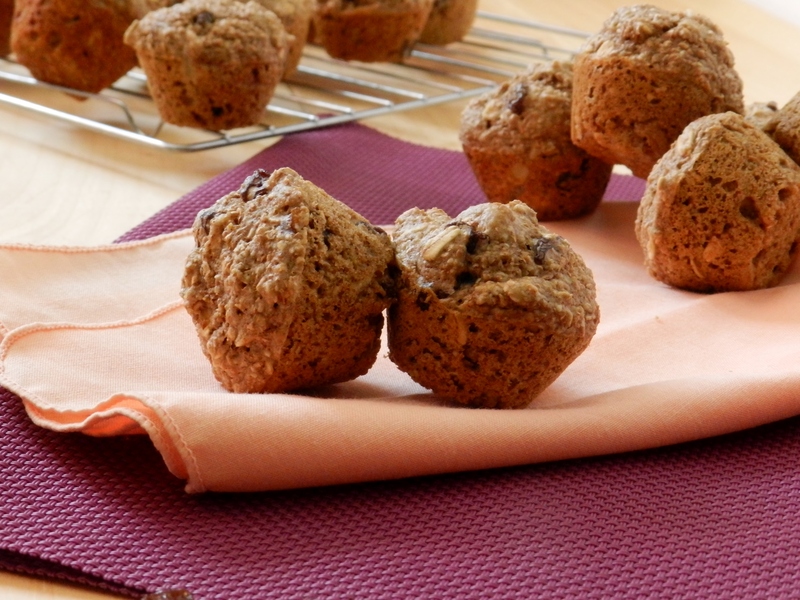 And they’re whole wheat, sugar-free, and delicious! Quite possibly the most addicting snack ever. 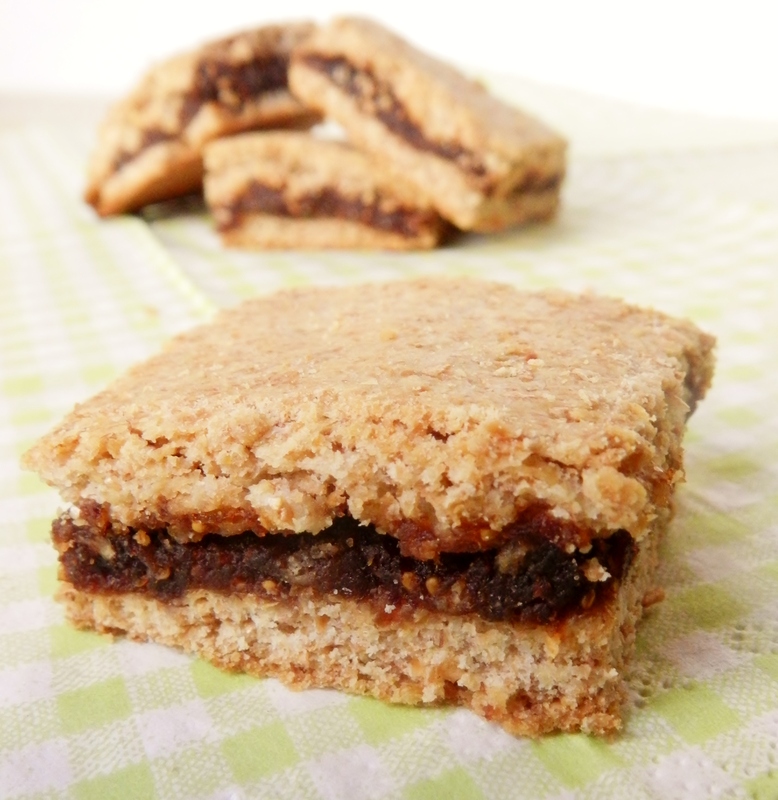 Want a hearty, chewy granola bar? Add lentils- simple as that. 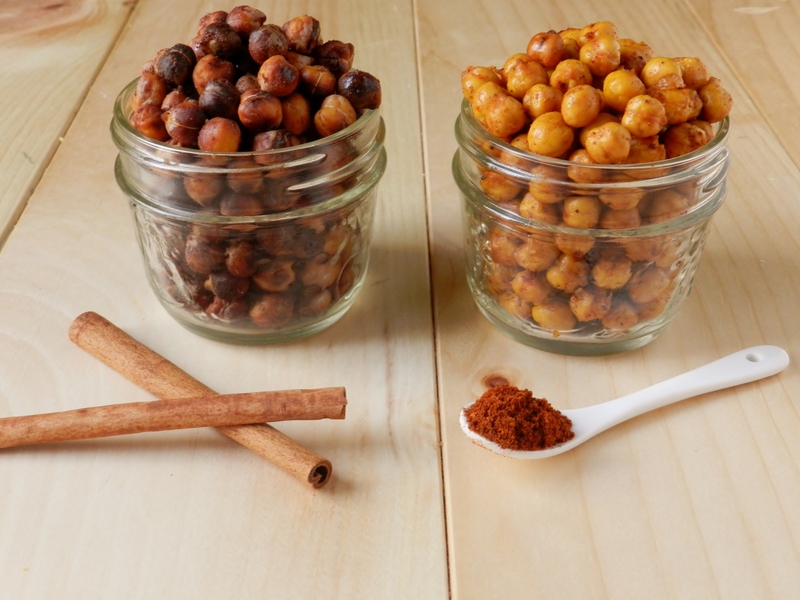 If you’re in need of a crunchy snack, nothing will satisfy that craving better than these chickpeas. 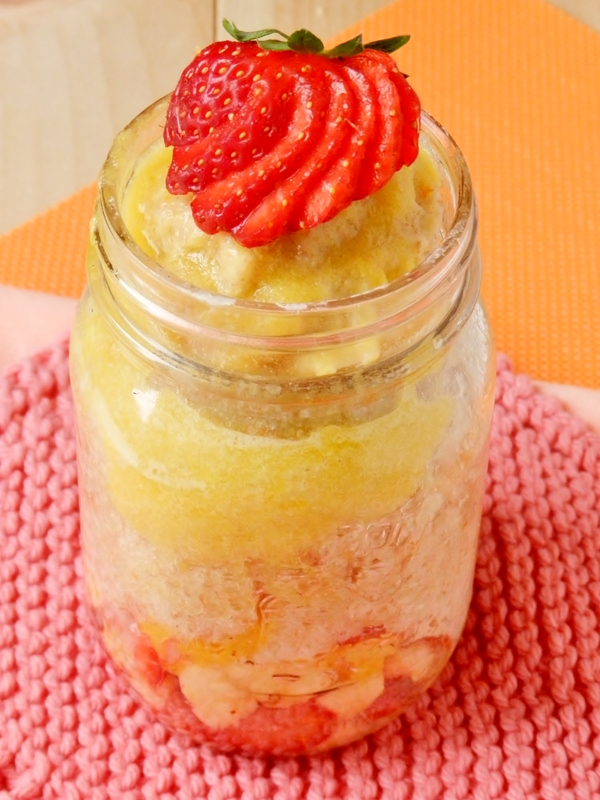 We recommend you never allow your pantry to be without a jar of them. 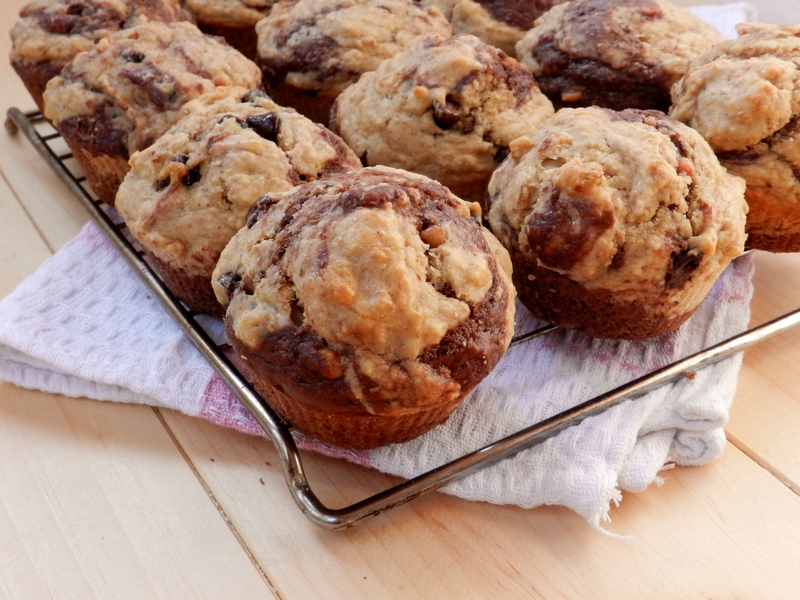 Muffins are always fantastic snacks, and these ones are some of the softest, most pillow-like muffins we’ve ever had. 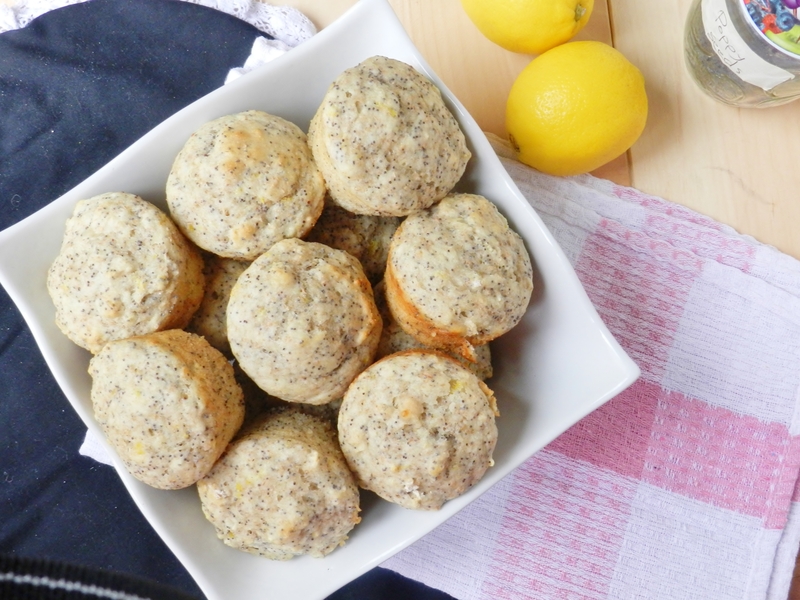 The lemon adds some zing and makes them almost refreshing, if it’s possible for a muffin to be that way! 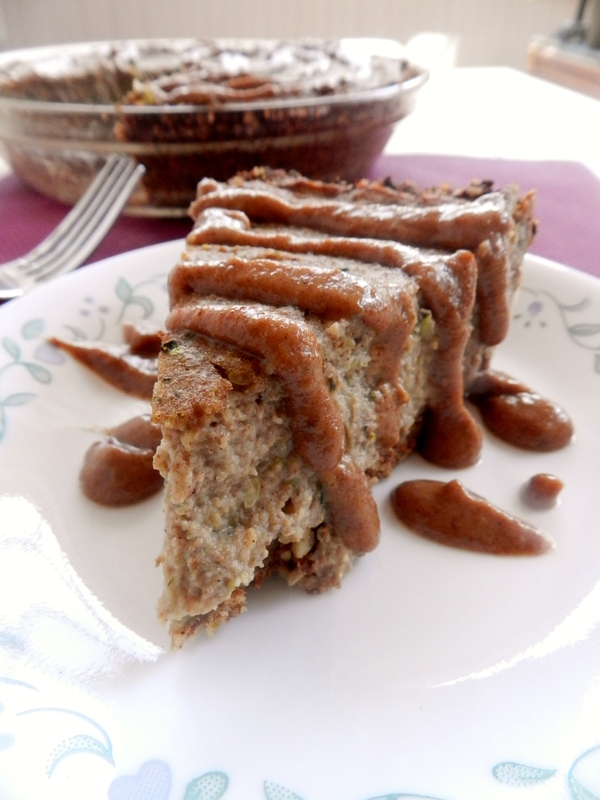 We’ve had several people make this recipe and rave about it! But if you’re in the gluten-intolerant crowd, never fear, our gluten-free red velvet brownies are sure to squash any brownie craving. 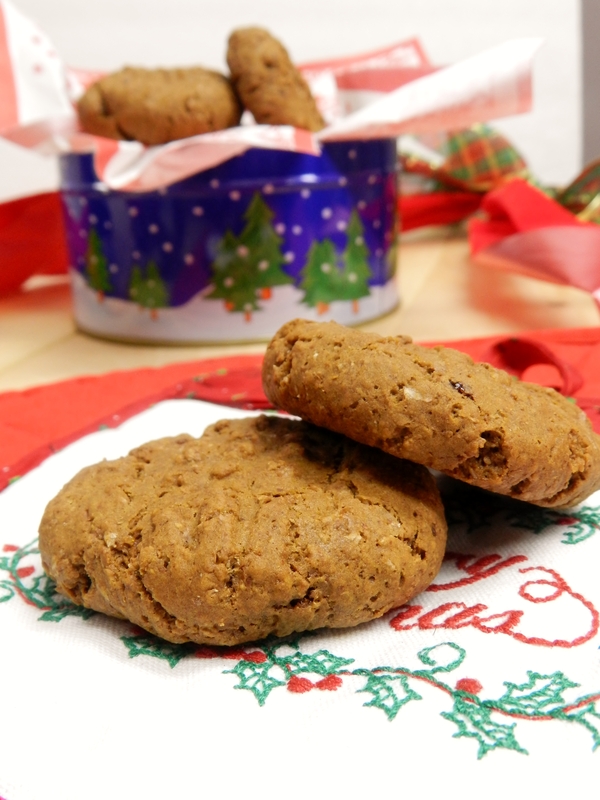 Don’t wait for the Christmas season to make these, they’re too tasty to only have once a year! Here’s another one that should not be held off until the appropriate season. Because really, is there truly a season for delicious, thick and creamy rice pudding? We like to think that sort of thing is a year-round treat. Who ever said vegans can’t have cheesecake has clearly never tried vegan cheesecake. Oh well, their loss! 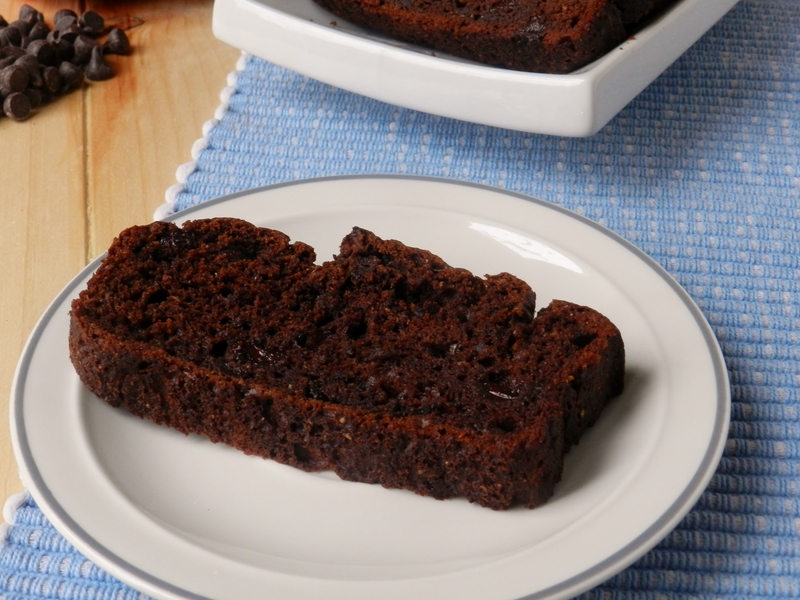 We also want to give honourable mention to our chocolate cake from our anniversary post. We didn’t include it in today’s round-up because we just wrote about it, but it needed to be mentioned! We hope you find something on this round-up that catches your eye, and that you have been enjoying the recipes we’ve been posting all year. If there’s something that you’d like us to make, please feel free to leave a comment or send us an email (twosaucysistas@gmail.com) – we love hearing from you! Posted in Uncategorized and tagged appetizers, banana stuffed french toast, bananas, beans, black bean brownies, black beans, blueberries, breakfast, brownies, cake, chai, cheese cake, chicken, chickpeas, chocolate, chocolate peanut butter, cookies, curry, desserts, dinner, dips, food, french toast, french toast recipe, fries, fruit, gluten free, greek, healthy, hummus, jam, kale chips, oats, pancakes, peanut butter, pork, pork n' beans, pudding, recipes, red velvet, red velvet cake, round-up, salads, salmon, salsa, snacks, spreads, stuffed french toast recipe, sugar-free, sweet potato, vegan, vegetarian, waffles. Bookmark the permalink. 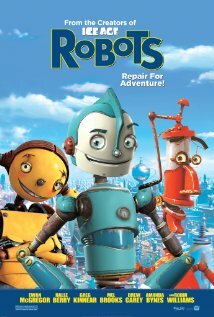 Does anyone remember the movie Robots? There was one line from that movie that always stuck with us- it was Rodney’s motto, “See a need, fill a need!” Don’t you think that’s a great rule to live by? We sure do, and that’s what we try to do when we create recipes. Find out what people want and need and make a recipe that fulfills those requirements. To put it a little more eloquently, this family member of ours has been experiencing some… difficulty with, you know… “moving things along”. The pain killers combined with the fact that he’s pretty well couch-ridden and can’t do a whole lot of moving around to (ahem) “shake things out” has left him with a little difficulty staying, well, regular. He also likes to snack. A lot. 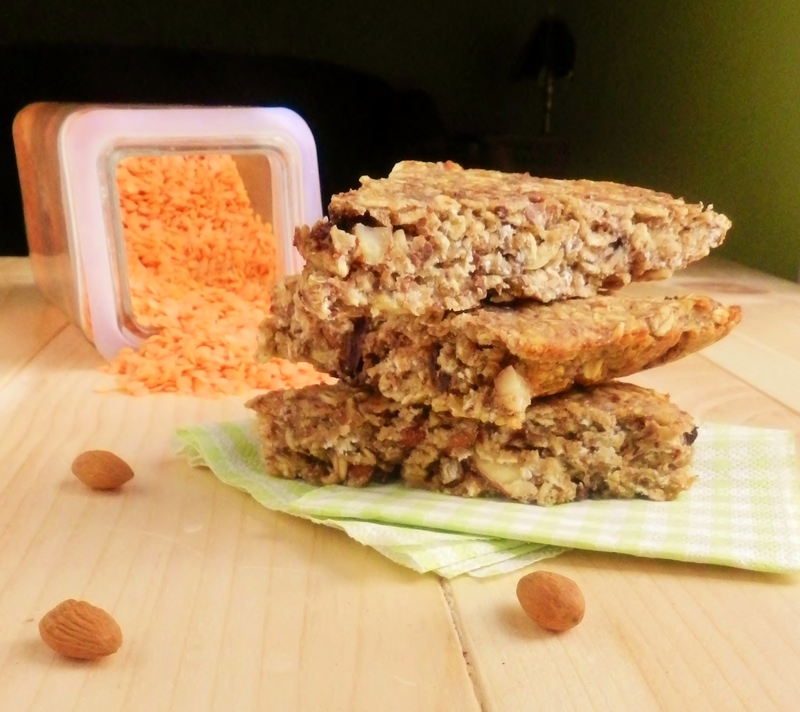 So we knew what we had to do- create a snack that’s full of fibre, but is low in sugar, and unhealthy fats, and of course it has to taste good, too! 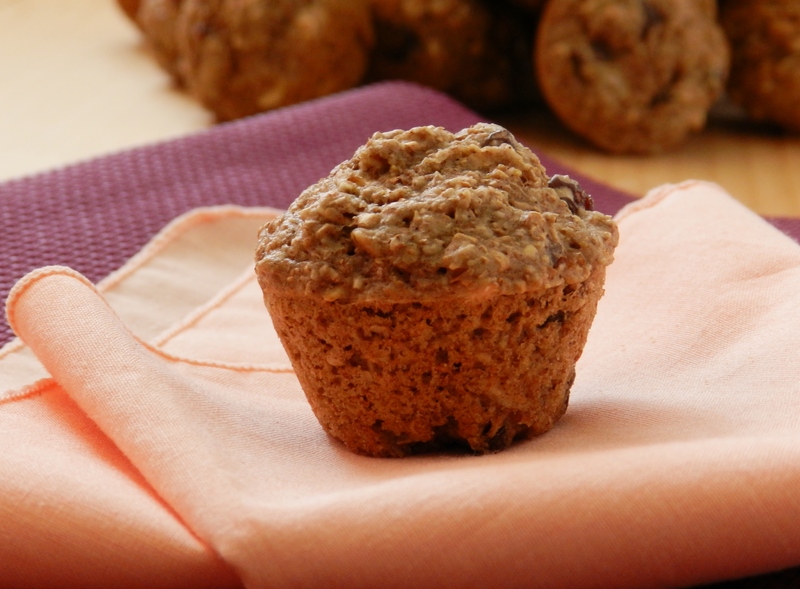 And thus, the super high-fibre date n’ raisin mini-muffin was created! 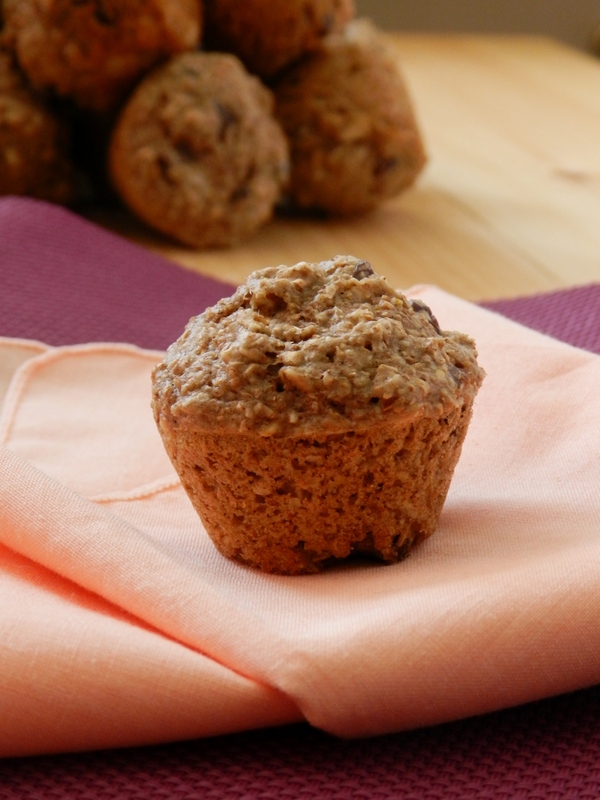 We decided to make these mini, because that way if he feels like he needs a little snack, he doesn’t have to commit to eating an entire muffin. But of course, these would be just as delicious if they were full-sized, all you’d have to do is bake them a little longer! So what makes these high fibre? 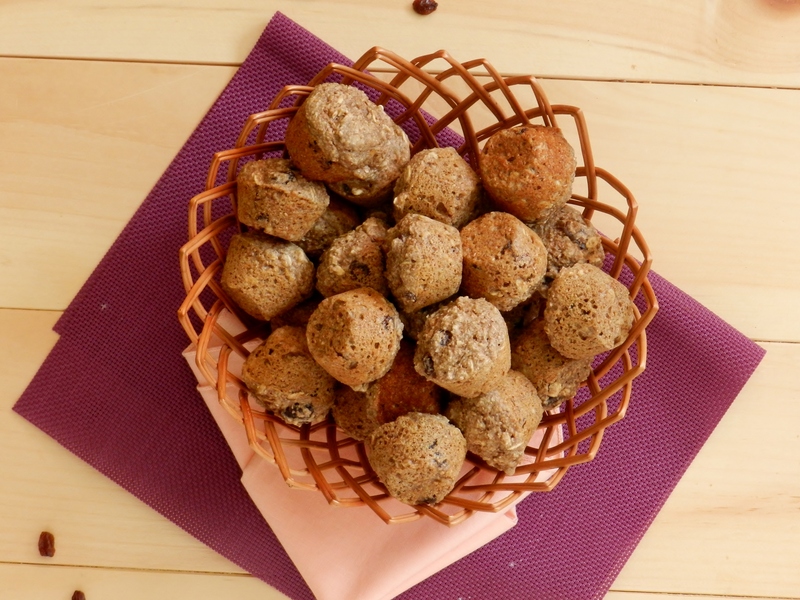 They have wheat bran, oat bran, rolled oats, and whole wheat flour. 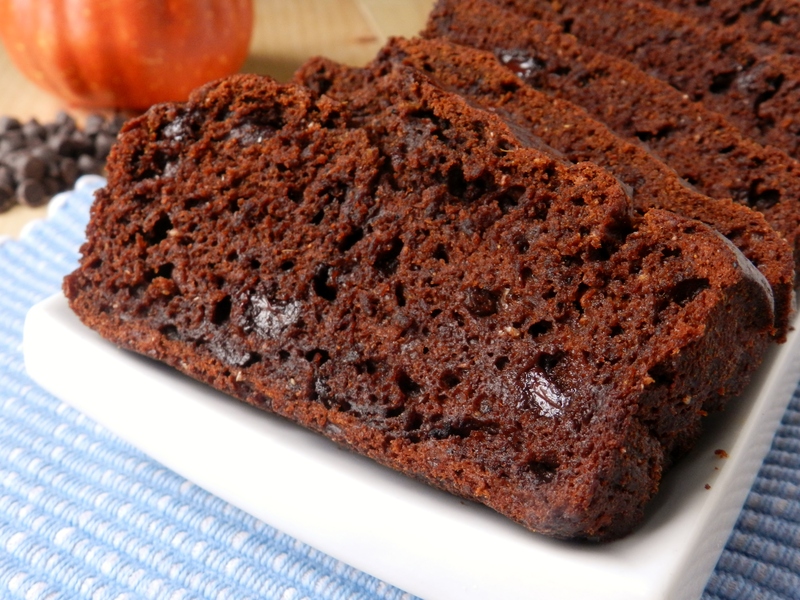 They also have dates and raisins, which are also good sources of fibre. So when all’s said and done, one of these mini muffins has 2 grams of fibre, which, considering their size, is quite a bit! And if you were to make them into large muffins, they’d be about 3 times the size, which would put them at about 6 grams per muffin! 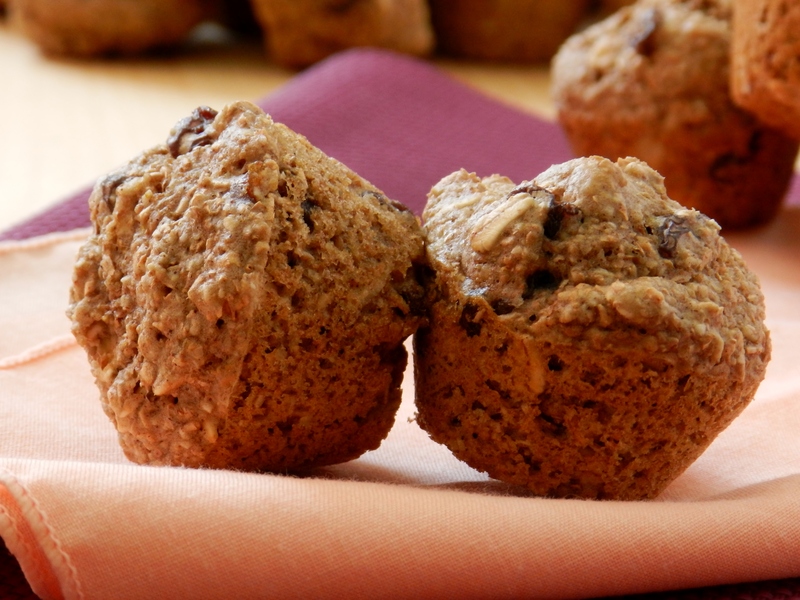 You could even amp-up the fibre content even more by adding some ground flax seeds and chopped almonds to these muffins- something we would’ve done if we hadn’t been all out! Combine milk and vinegar and set aside for 5min (to make “butter milk”). In a large bowl, combine the dry ingredients. In a separate bowl, combine the wet, only adding the milk after having sat for 5 min. Pour wet ingredients into the dry along with the dates and raisins and stir until just combined. 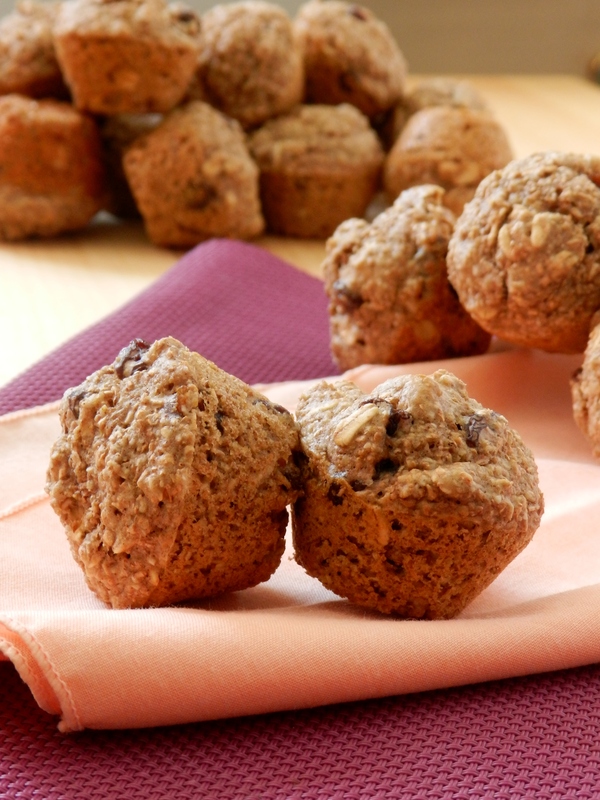 Fill greased mini-muffin tins with the batter. Have you ever had a surgery and experienced difficult side effects after wards? What did you do to overcome those difficulties? Posted in Uncategorized and tagged bran, bran muffins, breakfast, butter milk, dates, easy, food, good tasting, healthy, high fibre, high fibre muffins, knee surgery, low fat, make your own buttermilk, mini muffins, minimal levels, mmm fibre, muffins, no added oil, no added sugar, oat bran, pain killers, pain meds, quick, raisins, snack, tasty, whole wheat, yogurt, yummy. Bookmark the permalink. Hi everybody! Long time no-see! Saturday: Up super early to volunteer all day at a track meet, rush home and quickly pack up last-minute stuff, throw it in the van and rush home to baby sit. So, as you can see we’ve been a little pre-occupied with life these last few days- some of it boring, some fun, and some completely overwhelming and exhausting! In fact, neither one of us has hardly been on our computers at all! We’ve missed Simple Sunday, and Heather’s Meatless Monday (sorry, Heather…) but now that our lives are starting to settle down somewhat, we will be back to a more regular posting schedule. And as a sort-of apology for our prolonged absence, we bring you chocolate! And while we’re on the topic of chocolate, we think that this is the perfect time to fill you in on the chocolate-making party we attended in Toronto. (Pretty good segue, don’t cha think? ;)) A couple of the girls on the team have birthdays right around the same time, so we decided to combine them and move our celebration to Toronto for a fun little change of scenery. One of the girls found this amazing business that sends a Chocolatier to your home and teaches you and your guests how to make chocolate! First, our lovely instructor Cocoa Kelley (don’t you love that name?) gave us a brief history on chocolate. It was first made by the Ancient Incas and Myans, who used the cocoa beans to make a drink called “Chocolotal” (please forgive us if we misspelled that!) Fun Fact: in ancient times, before be-heading someone, they offered them a drink of chocolatal to help them relax. So considerate of them, right? Anyways, after the little history of chocolate was over, plenty of chocolate making/eating ensued, and of course we got to bring quite a large stash home with us! 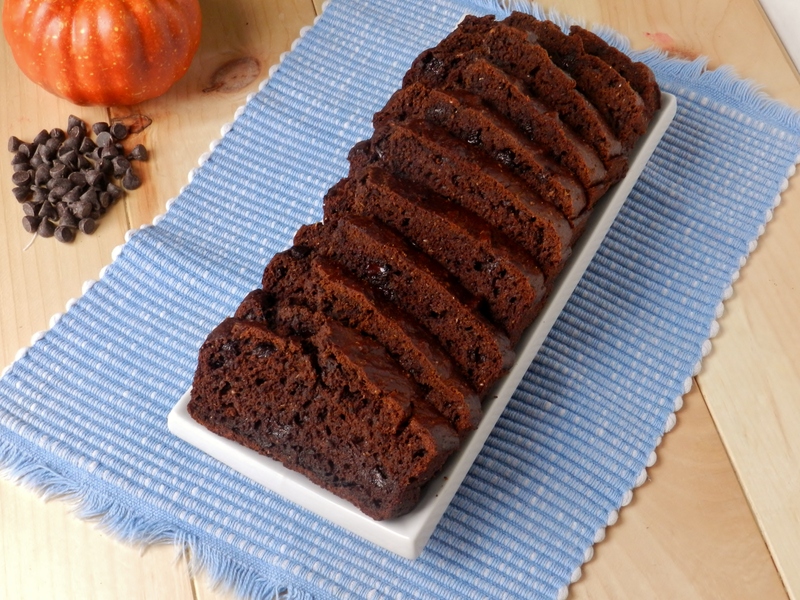 So now that we’ve got you thinking about chocolate, you’re going to go and make this delicious, chocolate (and pumpkin) filled bread, right? Preheat the oven to 350F. Spray a loaf pan with non-stick cooking spray. 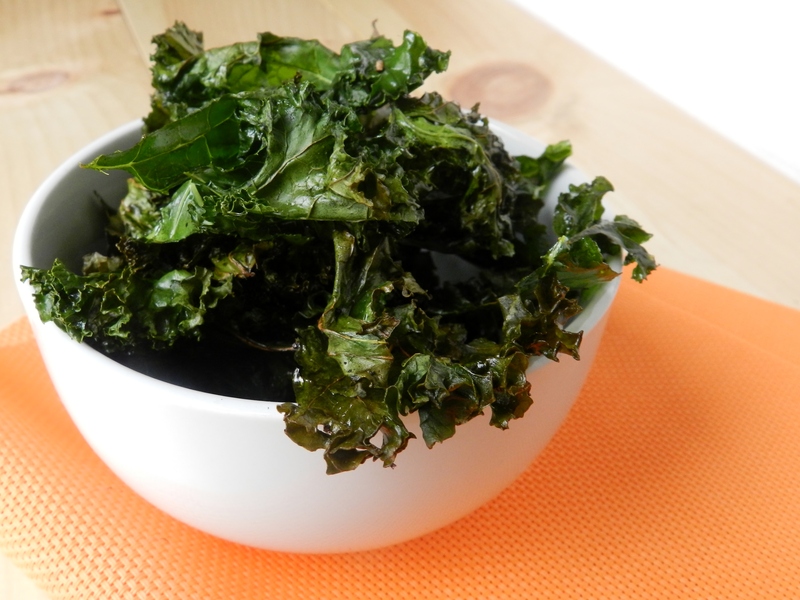 In a large bowl, combine the first 7 ingredients (all the dry ingredients). In a separate bowl, beat the eggs. Add the pumpkin, coconut oil, date paste and maple syrup and stir until smooth. (There may be a few lumps from the coconut oil- that’s ok). Add the milk and vanilla and stir again until the mixture is smooth. Add the wet ingredients to the dry ingredients and stir just until everything is combined. Add the chocolate chips and give it another quick stir, until the chips are evenly distributed and there are no dry spots in the batter. Pour the Batter into the prepared pan and bake on the centre wrack for 45-50 minutes, or until a toothpick inserted in the centre comes out clean. Have you ever been to a chocolate-making party? What is the coolest party you’ve ever been to? Posted in Uncategorized and tagged breakfast, busy, chocolate, chocolate bread, chocolate party, chocolate pumpkin bread, fibre, food, healthy, lame excuse, loaf, low fat, Meatless Monday, next school, pumpkin, pumpkin bread, quick bread, snack, sugar-free, sunday spring, useless stuff, vegetable, whole wheat, whole wheat flour. Bookmark the permalink.